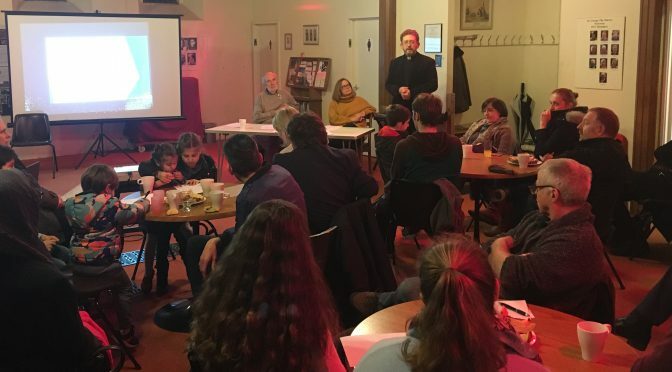 30 members of St. George’s Church and the wider Wolverton community turned out to hear about a proposed Sponsor Refugees initiative. 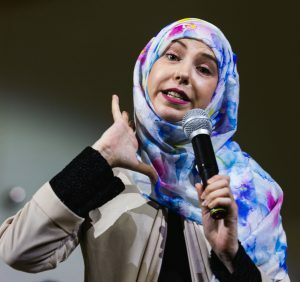 This has grown from a local resident’s offer of a house specifically to be a home for a family fleeing war-torn Syria and would be the first of its kind in Milton Keynes, following other successful initiatives in Canada and elsewhere in the UK. 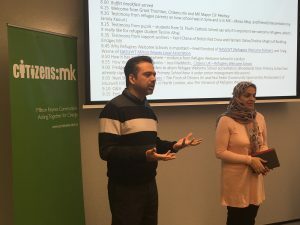 The initiative follows a Citizens:mk campaign which began in 2015 and, having secured pledges from MK Council, became an independent charity, Refugees Welcome, in 2016. 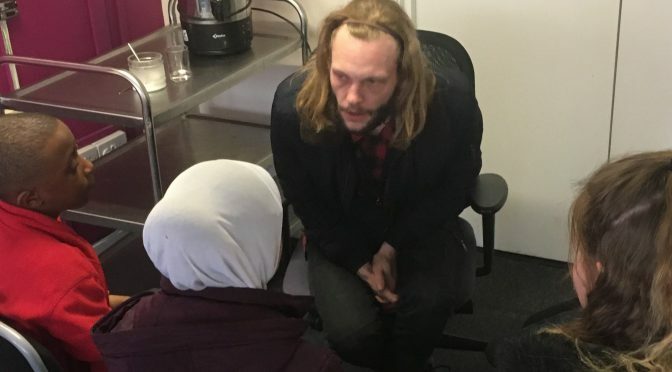 The meeting was co-chaired by Michael and Tori Snell and heard from a Syrian family who have lived in Wolverton for more than two years following settlement under the government’s Vulnerable Person’s Resettlement Scheme (supported by a previous Citizens:mk campaign). Rev Gill Barrow-Jones gave background to the initiative and researcher Sarah Dolphin gave the results of a recent survey of Wolverton people which showed 75% were in favour of the initiative. Rev Tim Norwood, co-chair of Citizens:mk, talked about how the scheme has worked elsewhere, the challenges – including the need to raise £9,000 for a two-parent refugee family – and the personal and community benefits of sponsoring a family in this way. 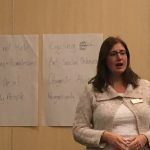 Local social entrepreneur Marie Osborne also spoke about what it takes go make social initiatives successful. It was decided to go ahead with a Sponsor Refugees initiative in Wolverton. The evening ended with individuals signing up to provide active support, e.g. help a refugee family learn English, access schools, etc. If you are interested to know more about MK’s first Sponsor Refugees initiative, and/or explore ways you can help, contact wolverton@citizensmk.org.uk. On the night of freezing 29th January, a small team of Citizens:mk leaders ventured to Stadium:mk, the home of MK Dons FC, for their game against Oldham Athletic. 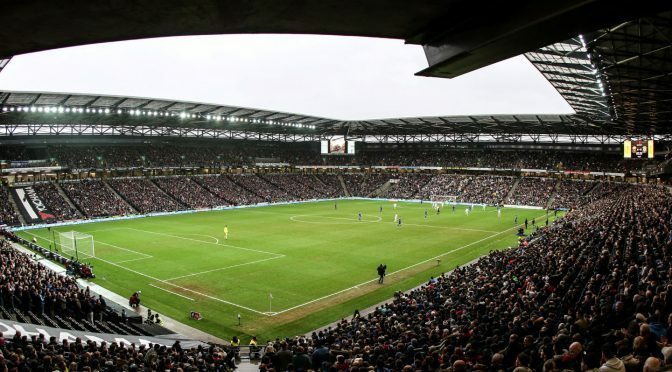 The purpose of this research action was to find out from workers at Stadium:mk, including both security and catering staff, how they perceived their experiences of working there. The action began at IKEA nearby, where workers there were asked about their experiences of working at IKEA. Three staff members were approached and all three said they were happy working for IKEA, highlighting the benefits of permanent contracts, flexible hours and progression opportunities. They felt cared for by the management team. At Stadium:mk, seven workers were asked, and the responses were more mixed. Most felt loyal to the club, but raised a range of including free parking facilities and promotion opportunities, both of which seemed very limited. One security supervisor had been in role for seven years with no pay increase or progression. One young security attendant was wearing just a fluorescent bib over her own clothes said the flourescent coats had run out. Others said that the 50p subsidy on hot drinks (sale price £2.20) was too low. This first ‘Fair Work’ research action was deemed successful in terms testing the questions which can now be used in similar research actions with workers from other companies in MK. Fortunately, because it was really cold, Dons won 2-1, though it was a bit of a scrape! 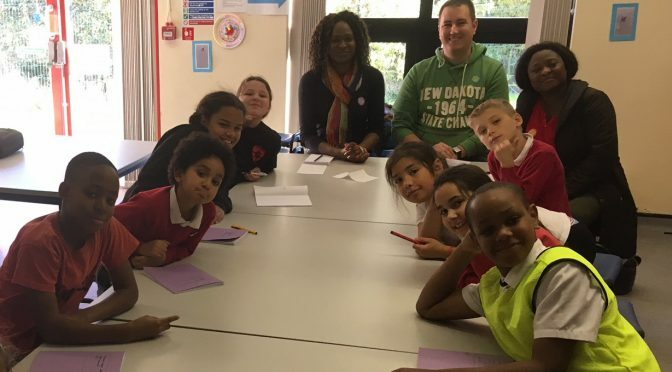 Jubilee Wood Primary School is the first school in MK to join a campaign being championed by teachers union NASUWT and community organising charity Citizens UK. 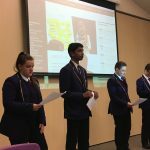 Following a breakfast launch hosted by Grant Thornton and Dentons solicitors at the end of November, six schools pledged commitment and three have already completed their accreditation booklet. The other two are Brooklands Farm Primary School and Lord Grey Secondary School. 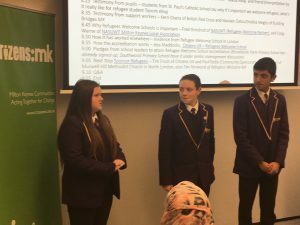 At a breakfast launch of the Refugee Welcome Schools initiative on Thursday 29th November, hosted by Grant Thornton LLP and Dentons LLP UKMEA, six MK schools committed themselves to achieving Refugee Welcome Schools accreditation. 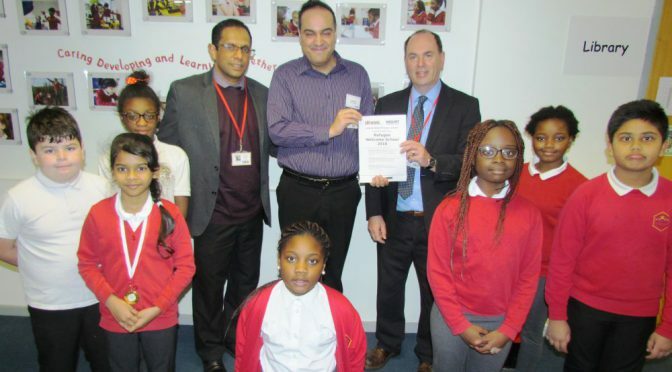 These included two mainstream secondary schools, two mainstream primary schools and two supplementary schools. This initiative promotes and supports a new standard for the awareness, welcome and action, which a school pledges to undertake in support of refugee and other new students in their school. 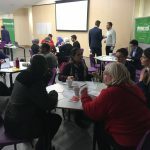 40 people from 18 institutions attended the event, which was organised by Citizens:mk, in partnership with NASUWT, and co-chaired by Kurshida Mirza and Hala Afify, members of the Citizens:mk Leadership Group. 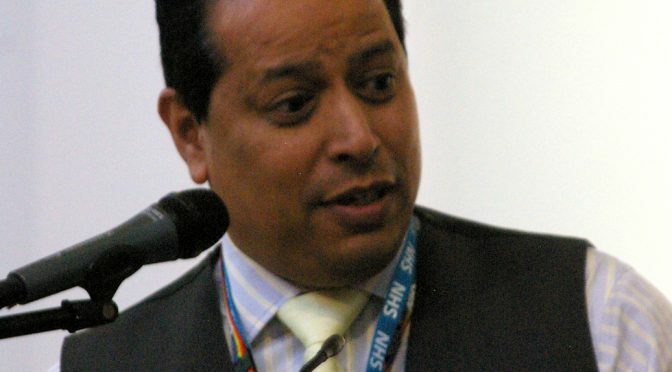 Cllr Martin Petchey, Mayor of Milton Keynes Council (pictured above), which has welcomed 16 Syrian refugee families to MK under the government’s VPRS scheme since 2015, opened the proceedings by referring to recent news of serious bullying of refugee pupils at a school outside Milton Keynes (read full story). Testimonies were then heard (through volunteer interpreter Jamila Kaouri) from three Syrian mothers and one teenage daughter, who have recently settled in MK, about the traumatic conditions of school provision in Syria compared with the warm welcome and access to services provided by Milton Keynes. This was followed by three students from St. Paul’s Catholic School (pictured above) talking about why they feel compelled to campaign for a warm welcome from their school community. 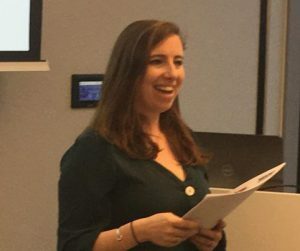 Support worker Kerri Chana of British Red Cross (pictured above), and Hasnain Datoo and Shelina Meghji of Building Bridges MK (pictured below), then spoke about the importance of supporting refugees and asylum-seekers with English language translation and teaching. 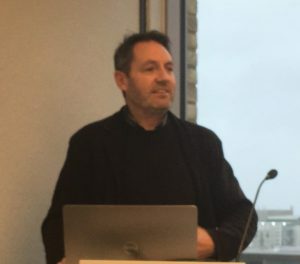 Fred Grindrod, Principal Official of NASUWT, a Refugees Welcome Partner (pictured above), spoke of the international movement to support refugee children and the importance to NASUWT of its partnership with Citizens UK. 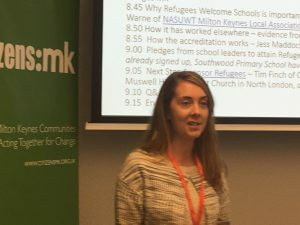 Jess Maddocks of Citizens UK explained that the Refugee Welcome Schools accreditation process was straightforward, quoting from the experience of Saint Gabriel’s College in south London, and said she could be contacted for further information about it. commitment Refugees Welcome Schools accreditation – Brooklands Farm Primary School (pledge received before the event), Jubilee Wood Primary School, St. Paul’s Catholic School, The Radcliffe School, Al Ajyad Supplementary School, Middle Eastern Language School (pledge received at the event of the event). commitment to discuss this at Senior Leadership Team meeting – Lord Grey School, MK College, Shenley Brook End School, Southwood Primary School (pledge received before the event). Finally Tim Finch (pictured above), Director of the Sponsor Refugees project created by Citizens UK, and Paul Eedle (pictured below), Community Sponsorship Ambassador of Muswell Hill Methodist Church in North London, talked about the benefits of Community Sponsorship and how a school community might embrace this opportunity. In post-action evaluation, the event was given a score 8/10, with praise for the turnout and criticism of directions about parking arrangements and lack of working microphone. Cycle Safety – Craig Broadbent, Deborah Cooper and Phil Ashbourne of Green Alliance, Leo Nicholas of St. Paul’s Catholic School; The Open University. 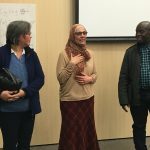 Fair Deal/Work – Hala Afify and Linda McComie of Truby’s Garden Tea Room, William Appaih of St. Augustine’s Catholic Church; Middle East Cultural Group. Housing & Homelessness – Lawrence Morgan and Carol Barac of Green Alliance, Ayser Al jawad of Middle East Cultural Group. Mental Health – Saira Sajid of MK Academy; Gabi and Tom Navin of St. Paul’s Catholic School, William Appaih of St. Augustine’s Catholic Church. Police at Primary Level – Tony Berwick of Jubilee Wood Primary School, Kate Matthews of Southwood Primary School; St. Paul’s Catholic School. Refugees Welcome Schools – Elysia Roach of St. Paul’s Catholic School, Craig Warne of NASUWT, Susie Hancock of The Open University. 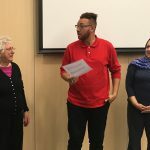 Youth for Elderly – Richard Lyons of St. Frideswide’s Church, Sofia Hassan of Middle East Cultural Group, Rachel Redford of The Open University. The goal of each team is to create SMART campaign goals to propose to the Delegates Assembly on 5th February 2019, where three campaigns will be selected for action with power holders at the Accountability Assembly on 25th April 2019. Research team leaders were asked to contact Community Organiser Tom Bulman, tel 07962 838685, asking him to attend their first research team meeting and deliver training to the team. 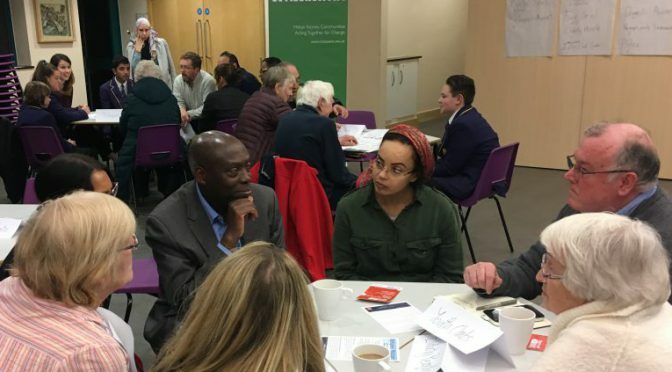 An alliance-wide training workshop has been arranged for Saturday 1st December 2018, 9.30am-1.30pm at St. Frideswide’s Church, where leaders from all teams/institutions will receive Action Research training from Tom and Jonathan Cox of Citizens UK. In post-event evaluation, this internal action was scored 8/10. Below are pictures from Leaders Forum 2018. 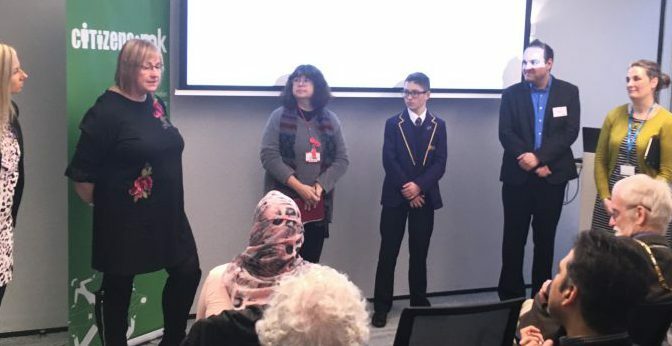 At the start of national Hate Crime Awareness Week, more than 100 people – including school pupils, academics and MK’s civic and business leaders – gathered at The Open University for Citizens:mk’s ‘Fight Against Hate’ day of action on 15th October 2018. 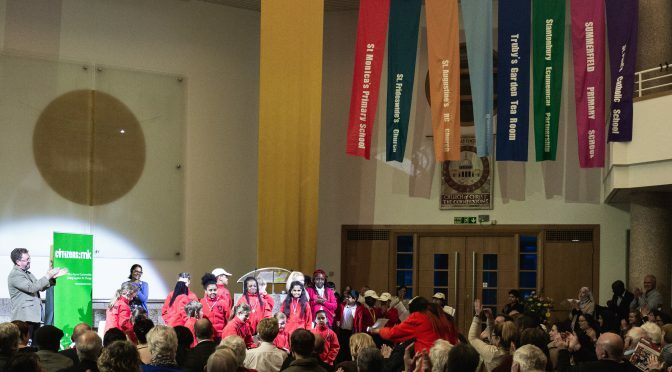 After a welcome from The OU’s Josie Fraser, and a series of powerful testimonies about racial, trans and religious hatred, the audience heard songs from the students of four schools – Great Linford Primary, Jubilee Wood Primary (pictured below), Summerfield Primary and St. Paul’s Catholic Schools. Then power-holders – including Arriva Buses, MK Council, MK Dons and Thames Valley Police – were asked to make pledges (see pledges below). In post-event evaluation, the action was scored 8/10. Afterwards lead organiser Jiten Patel, Head of Equality, Diversity and Inclusion at The OU, said: “I’m delighted to see so many coming to support our aspiration for a safer community in MK”. 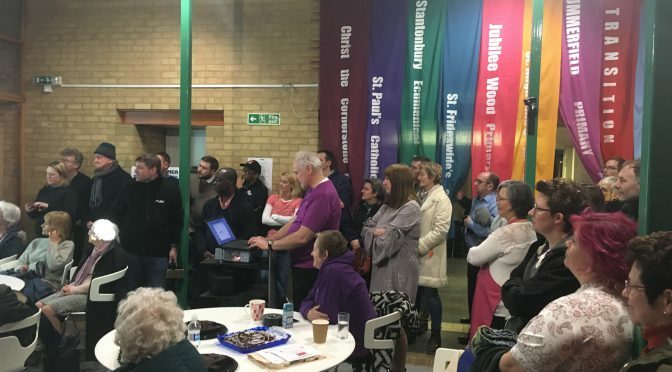 Campaign leader Fidele Mutwarisibo, of Church of Christ the Cornerstone and also at The OU, said: “It’s great to see our campaign getting stronger and stronger”. 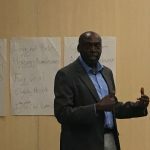 Dr Fidele Mutwarisibo recorded the event at http://www.open.ac.uk/research/news/mygration-ou-marks-launch-national-hate-crime-awareness-week. Work with Citizens:mk Fight Hate Crime campaign leaders to develop and deliver a 12 month communications plan, sending out monthly messages encouraging our staff to be more aware of hate incidents/crime and to report the same, either internally or directly to the Thames Valley Police Service (This will also include bullying and harassment which often lead to poor productivity, high stress, and related sickness absence). Invite Thames Valley Police to deliver up to 3 one-hour training sessions to selected staff in recognising and addressing Hate crime/incidents so that our staff, students, and our citizens can feel safer in Milton Keynes. 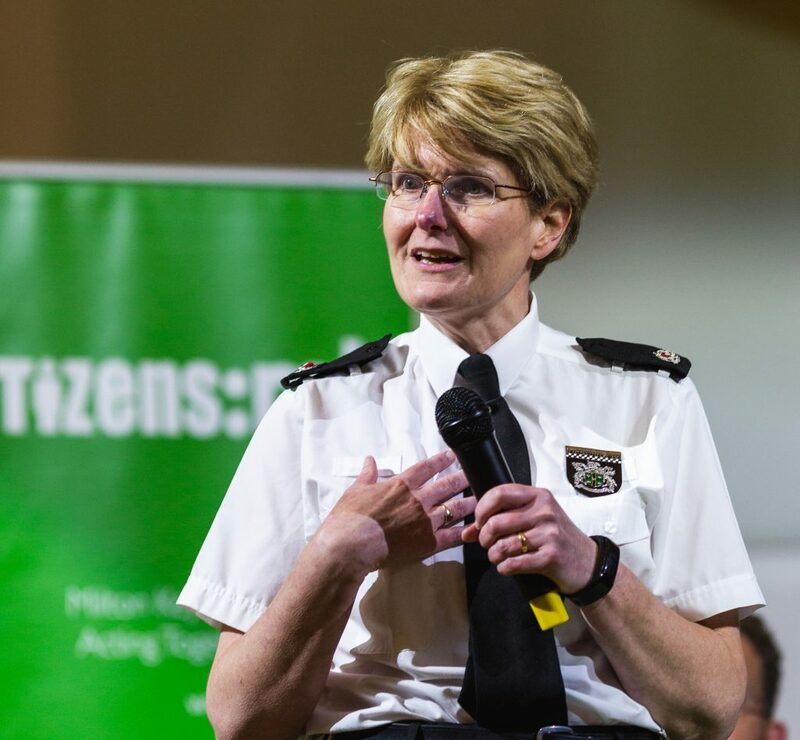 Come and report progress achieved in terms of the messages communicated and numbers of incidents reported, at the citizens:mk accountability assembly in Spring 2019. 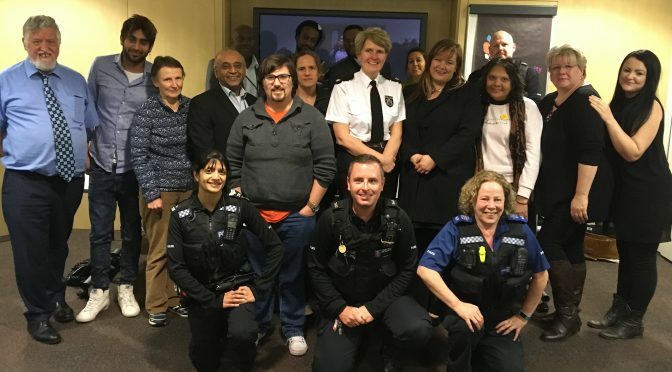 Invite Thames Valley Police to deliver up to 3 one-hour training sessions to selected staff and students of The Open University in recognising and addressing Hate crime/incidents so that our staff and our citizens can feel safer in Milton Keynes. Work with Citizens:mk Fight Hate Campaign leaders to develop and deliver a 12 month communications plan, sending out monthly messages encouraging our staff to be more aware of hate incidents/crime and to report the same, either internally or directly to the Thames Valley Police Service (This will also include bullying and harassment which often lead to poor productivity, high stress, and related sickness absence). To negotiate with Council staff to invite Thames Valley Police to deliver up to 3 one-hour training sessions to selected council staff in recognising and addressing Hate crime/incidents so that your staff and our citizens can feel safer in Milton Keynes. Come and report progress achieved in terms of the messages communicated and numbers of incidents reported, at the Citizens:mk accountability assembly in Spring 2019? 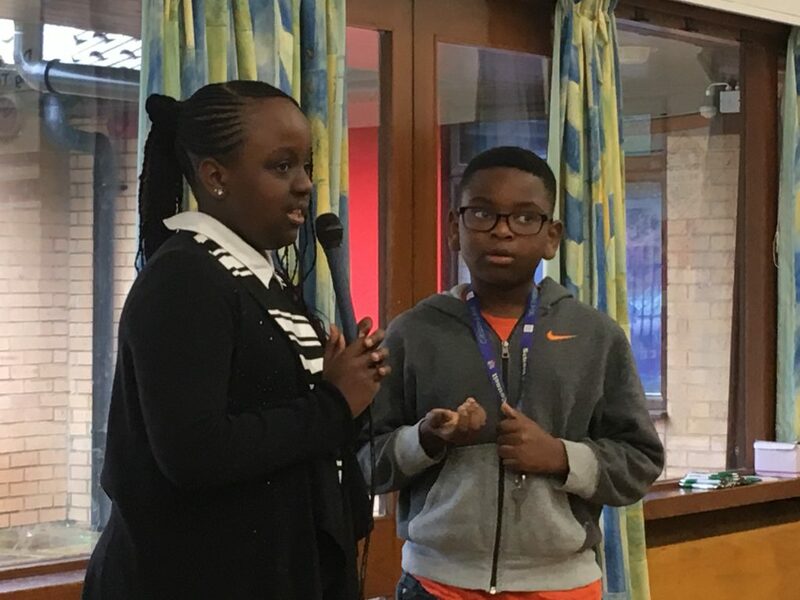 (With their agreement) Deliver one-hour training sessions to at least 4 schools in Milton Keynes during the next 12 months to up-skill school council members and school playground supervisors (where permitted by schools) in recognising and addressing Hate crime/incidents so that our future leaders can feel safe in their places of study. 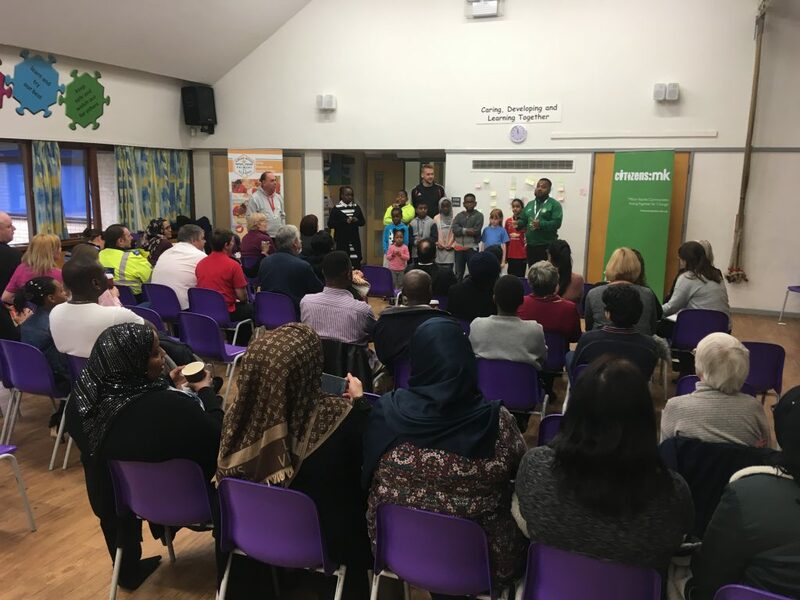 Deliver 3 one-hour training sessions to selected staff and volunteers of MK DONS in recognising and addressing Hate crime/incidents so that our future leaders can feel safer in Milton Keynes. 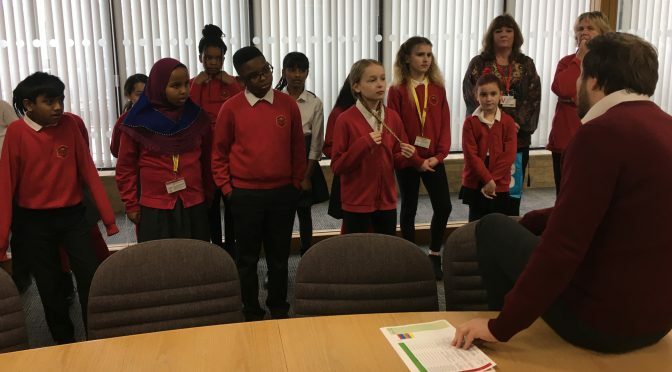 Negotiate with the Leader / Deputy Leader of MK Council to deliver training sessions to selected staff at the MK Council in recognising and addressing Hate crime/incidents so that our future leaders can feel safer in Milton Keynes. Deliver up to 3 one-hour training sessions to selected staff and students of The Open University in recognising and addressing Hate crime/incidents so that our citizens can feel safer in Milton Keynes. 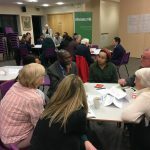 Come and report progress achieved in terms of the messages communicated, numbers of incidents reported, and number of training sessions agreed/delivered at the Citizens:mk accountability assembly in Spring 2019. 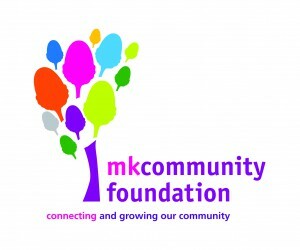 Invite all schools who participated in the Harmonies 4 Harmony Music Festival to take part in the MK Dons Parade Day on 4th May 2019 and to promote the ‘Fight Against Hate’ Campaign. Provide an allocation of spaces to MK Council, Thames Valley Police, Arriva Buses, Network Rail and the Open University to promote the ‘Fight Against Hate Campaign’ on 4th May 2019. 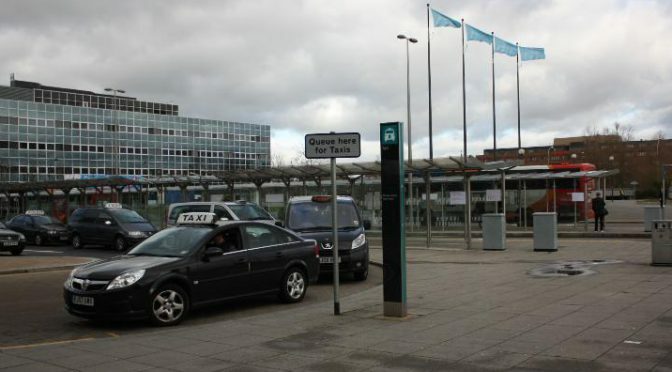 Display banners and posters, and to provide space in front of the MK DONS Stadium for an Arriva Bus displaying the’ Fight against Hate Poster’ on 4th May 2019. 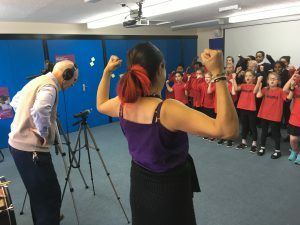 Select one school from those who have prepared and presented songs the Open University’s Harmonies 4 Harmony festival on 15th October, 2018, to perform their song at the DONS on parade day 4th May 2019. Promote the ‘Fight Against Hate Campaign’ by agreeing for Thames Valley Police to deliver 3 x 1 hour sessions in recognising and addressing Hate crime/incidents to our staff and stewards so that our citizens can feel safer in Milton Keynes. On Friday 5th October, 63 pupils from five member schools completed Citizens:mk’s annual One-Day School Councillor Training, this year hosted by St. Paul’s Catholic School. The other schools were Jubilee Wood, St. Monica’s, Southwood and Summerfield primary schools. 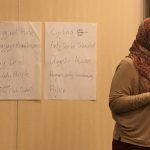 The theme for the Training was Refugees Welcome. 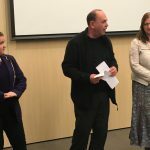 The pupils heard testimonies from two Syrian teenagers who were welcomed in Milton Keynes two years ago; also from British Red Cross, who facilitated their settlement and Ian Fraser, Head Teacher of Summerfield School, who was involved in welcoming refugees in his previous MK primary school. 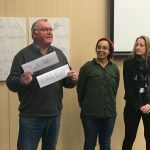 Representatives from MK Council, Thames Valley Police, NASUWT Teachers Union and Citizens UK presented ideas of campaign goals which the pupils might adopt, relating to hate crime awareness. The pupils prioritised the number one shared goal of ‘becoming a Refugees Welcome School’ with the aim being to persuade their number one power-holder, i.e. head teacher and/or chair of governors, to formally agree it. They then drew up power analysis maps to identify the key power-holders, and discussed ideas for acting on their interests to achieve the campaign goals. The day ended with role play negotiations with power holders followed by a run-around game involving the key terms in community organising: power, interest, stick person, relationship, negotiation. Click here for the programme of the day. Pictured is Bekele Woyecha of Citizens UK and Sponsor Refugees. Driving on the M1 to attend the 6-Day leadership training course organised by Citizens UK, I could not help but thinking how I got involved with this organisation and what am I going to benefit from this course. Only six weeks before, I was working as an Arabic Language tutor with the Ministry of Defence (MOD), I loved my job and the rapport that I built with my students over the two and half years that I worked there was great. I was looking forward to the summer holidays, a time in which my family and I go back to Cairo to see our relatives. Then the bomb shell fell, I received a notice of termination of contract with immediate effect. I was devastated, considering this decision came only after ten days from the renewal of my contract. I realised that as a contractor I did not have any rights under zero-hour contracts, unlike employees who could go to a tribunal for unfair dismissal, nor did I have the right to appeal. I was, in every sense of the word, stuck and the overwhelming feeling of injustice and shock engulfed me to the point of despair. Then I bumped into a dear friend of mine, Kurshida Mirza, at the door step of the Citizen’s Advice Bureau in Milton Keynes. I told her about my ordeal and she suggested that I speak to the community organiser of Citizens:mk, Tom Bulman. Tom and I met and he mentioned the 6-Day training course. Driving back home after finishing the course, my head was full of ideas, plans, questions, answers, good memories, but above all, a sense of relief due to the skills I acquired during the course. On the first day of training, we were engaged in the most interesting yet provocative role play; The Athenian/Melian Dialogue. At the beginning of the task, I had so many detestable stereotypical views about power holders, and very favourable opinions about ordinary people whose only power is to take the moral high-ground. To my utter surprise, at the end of the task I appreciated the Athenians, the power holders, and wanted to emulate their tactics and vision. The lesson I learnt is that power is good and it is a force to be embraced, not shunned. Relational power is the ultimate power to be sought and this can be achieved by conducting 121s, establishing self- interest, acquiring leadership role, and actively building core teams to serve the goal of the group or the campaign. The other crucial concept is that of bringing about change to achieve social justice. The experience I had with the termination of my contract left me feeling isolated and helpless. However, when I started thinking that I would not want anyone to feel what I felt, I realised that the change I am seeking is not only to benefit myself but every contractor who may experience such treatment under the terms of such contracts, and this emboldened me with a sense of purpose. I went to a course in leadership, however there is no real leader without followers; followers who share the vision, feel the same pain, are power hungry in the wider sense of the word. So, I need to hear from people who have been in the same unfortunate position, people whose contracts have been terminated abruptly, people who want to see changes in the terms of self-employment and zero-hour contracts, people who want to follow me in my campaign against these contracts. You are invited to attend a free film and discussion event hosted by Transition Town MK (TTMK) in partnership with MK CLT and a number of other community groups in Milton Keynes. The event is on Monday 25th June 2018, 7.30pm, at the CentreCom community centre in Central MK. This will include discussions on the variety of community-led housing models. (6 short films, approx 6-10 minutes long on successful schemes in UK). Click here to attend. 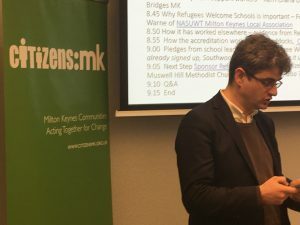 At the Accountability Assembly on 24th April, Citizens:mk obtained pledges from all MK Council party leaders pre-election to support the principle of setting up a ‘Community Land Trust’ (CLT) in Milton Keynes. This is a goal of the Citizens:mk House The Homeless campaign. 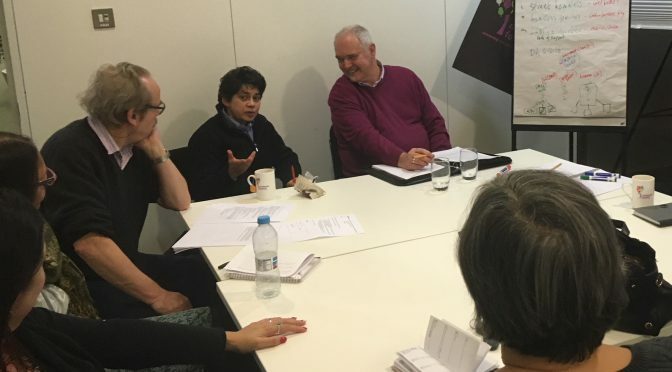 The steering group of the fledgling CLT meet every three week (all are welcome to attend the next meeting on 4th July – contact Lawrence.morgan@chamk.org.uk). Lawrence Morgan, of Transition MK is leader of the House the Homeless campaign. 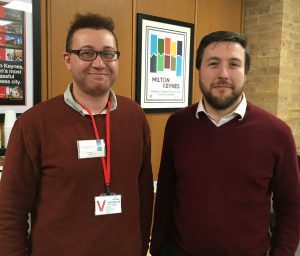 He is also a member of The Big Local Conniburrow partnership and works for ‘Community Housing Action:MK’ (CHAMK), a start-up social enterprise which has been lobbying the council to adopt community-led housing since start of 2017. Use MKDP land to deliver more truly affordable housing, requiring at least 36% affordable housing on development sites. Develop a new housing co-operative, by working with local people on proposals for a Community Land Trust to provide and maintain truly affordable housing. Bring disused and empty housing back into use, by using all powers available to the council including use of Compulsory Purchase Orders. 75,000 new truly affordable homes by 2050, as part of any additional future growth. 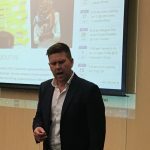 Lawrence Morgan said, “It’s been a long journey, when I arrived back in England in 2016 at the high of the Brexit referendum campaigns, after having been in the southern hemisphere for 3 years. I moved to Milton Keynes as have some families ties here, my first 8 months were sleeping on my grandmother’s conservatory floor and an unreliable job on zero hours for Tesco distribution centre in Fenny Lock. Everything seems to of changed in my home country, I had serious case of post travelling blues borderline mild depression. 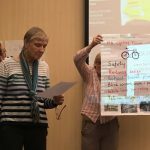 “This movement is nothing new, Milton Keynes has a history of co-operative housing models in the form of Rainbow housing Co-op in New Bradwell and Giffard Park Housing Co-operative in Giffard Park. It’s been steadily growing across the UK and backed by central government in the form of the “community housing fund” and other powers through devolution and the Localism Act 2011. We are seeing elements of David Cameron’s’Big society’ coming through. “We do not have to look far to see further examples of community-led housing. In our other two neighbouring cities along the growth corridor, Cambridge and Oxford there are great examples of community groups working in partnership with their local community foundation, community action organisations and supported by the City Councils. “Given that Milton Keynes has a heritage of innovation from its very inception by the MK Development Corporation, we are in a prime position to leverage the resources that are being pumped into the growth corridor by central government. If this is going to be sustainable growth in the area we have to look outside the box of commercial developers who use a broken house market for profits, do not provide anywhere near actually genuine affordable homes compared to earnings. 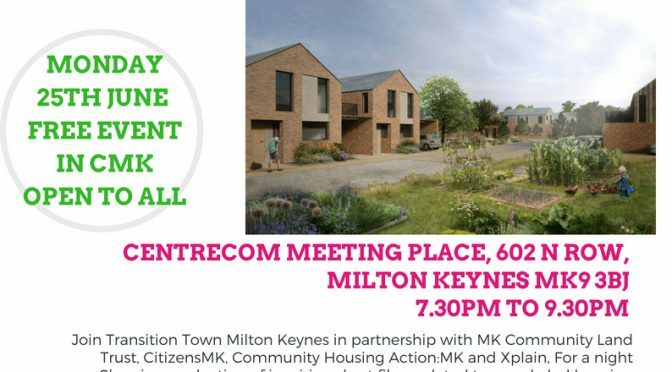 “Community Housing Action:MK is preparing itself to become a non-profit developer of genuinely affordable co-operative homes with the aid of the MK Community Land Trust which has the ability to hold assets for the benefit of the community in perpetuity. The leaders of MK’s main political parties have pledged to support all the goals of all four current Citizens:mk campaigns. 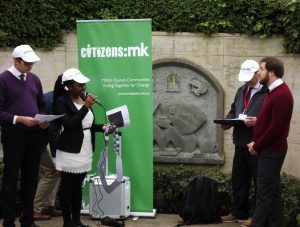 Their pledges were made at Citizens:mk’s seventh annual Accountability Assembly, which took place at Cornerstone Church in Central Milton Keynes on 24th April. 225 people attended, including representatives from 17 member institutions and 24 other MK institutions. After a members’ roll call, and the power-holders being led in by school children, the audience enjoyed a presentation of campaign successes over the past year. 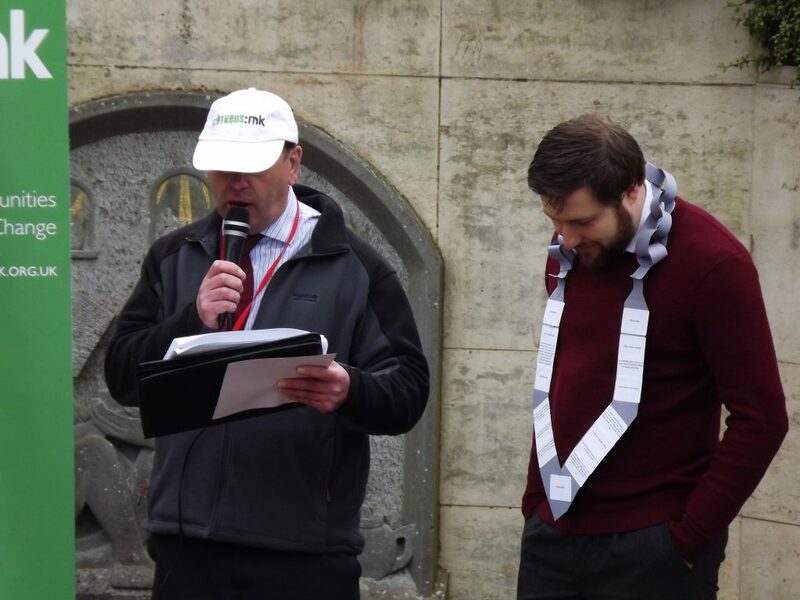 Cllr Peter Marland, Leader of MK Council (pictured above), was thanked for his role in delivering 130 Redway improvements – more than double the target of the Redways Relaunch campaign for MK’s 50th birthday year. Then goals for the year ahead were presented by each campaign team (Fight Against Hate, Life Skills & Young People, Mental Health and House the Homeless) and pledges of support were received. Powerful testimonies were given from the victims of hate crime. 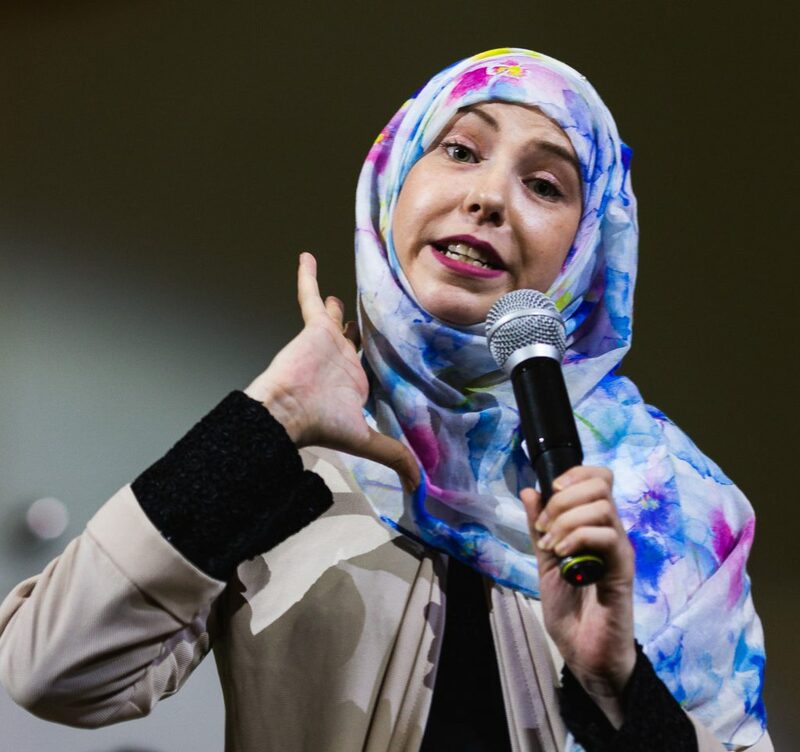 Jennifer Parsons of MK Muslim Association (pictured above), related how she had been verbally abused for wearing a hijab. 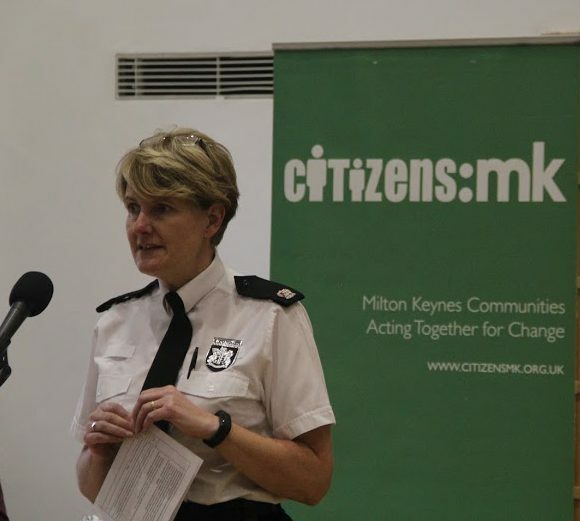 Supt Yvette Hitch, Area Commander for Thames Valley Police Milton Keynes (pictured below), stated her aim to deliver a police service for the whole community including marginalised communities. In a one-to-one conversation during the break with Philip Shamamba, leader of MK Congolese Community, she agreed to attend an special meeting with that group. Arriva Buses and Network Rail pledged to support the Fight Against Hate campaign with a poster display action during national Hate Crime Awareness Week in October. The Mental Health campaign team won a pledge from the Deputy-director of MK Mental Health Service for further partnership in the campaign. The students of St. Paul’s Catholic School (pictured above) won a pledge from their head teacher to include more finance skills education in the school curriculum. Following a request from the House the Homeless campaign team, many members of the audience agreed an action to contribute to MK Council’s current consultation on affordable housing. 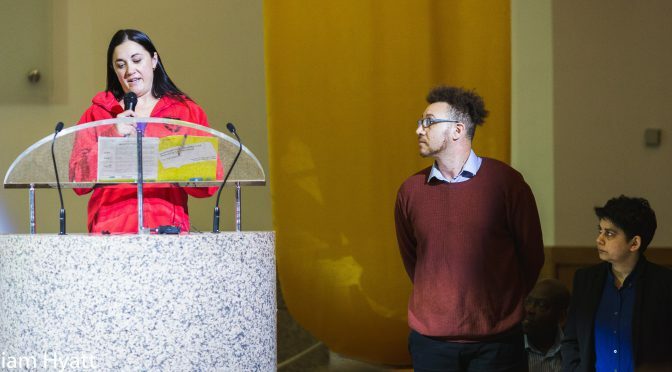 Each of the three political party leaders responded ‘Yes’ to each of Citizens:mk’s campaign asks and spoke briefly about their own party manifestos for the upcoming Council elections. 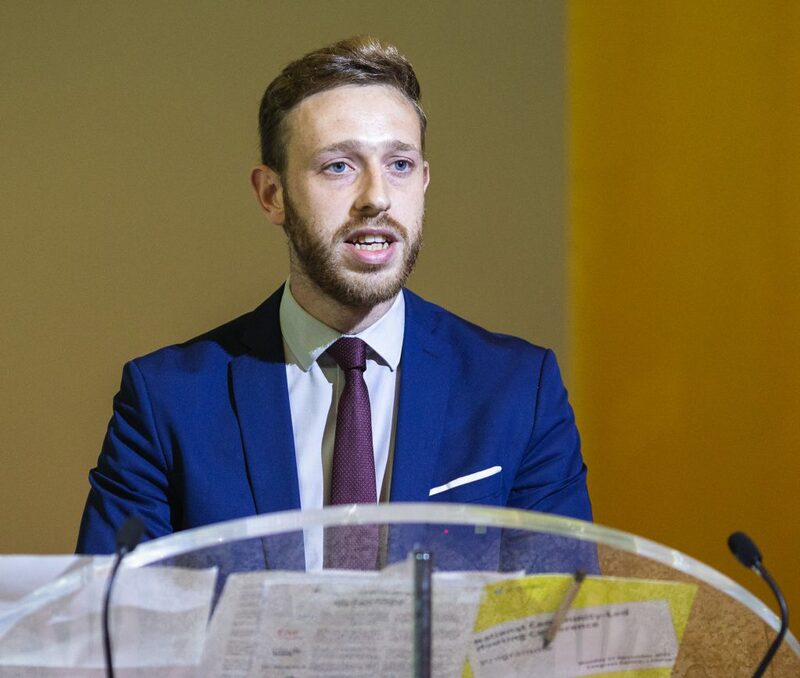 Cllr Alex Walker (Conservative), attending his first Accountability Assembly (pictured below), said he was impressed by the diversity of the Citizens:mk alliance and looked forward to working with the alliance. 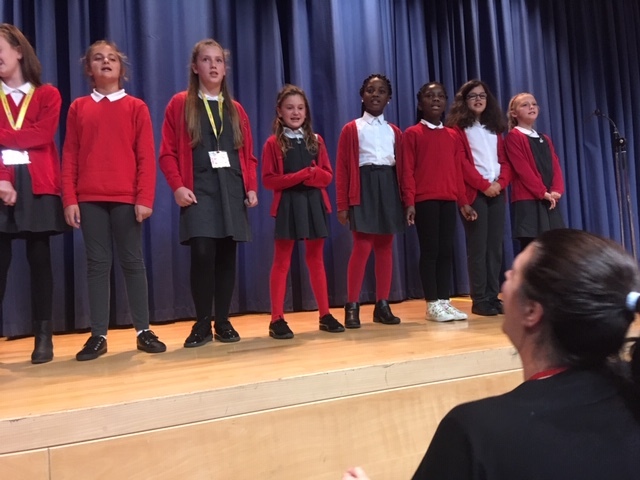 The event ended with a rousing rendition of ‘We Built This City’ led by the choir of Summerfield Primary School (pictured below). 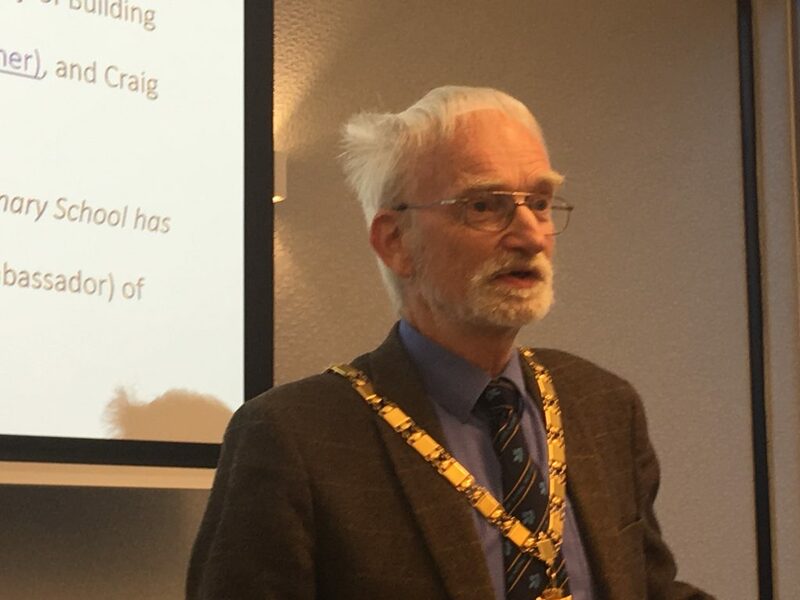 Mayor David Hopkins (pictured below) gave a final vote of thanks to all campaign team members and power-holders before the seventh annual Accountability Assembly was closed. In a short evaluation by 25 participants immediately afterwards, the Assembly was scored 8/10. 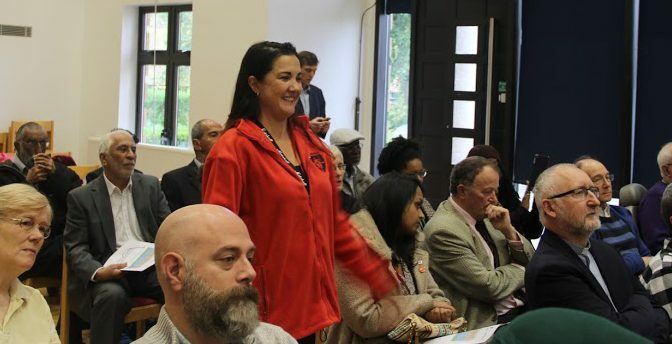 Following the request by Lawrence Morgan, leader of our House the Homeless campaign team at the Accountability Assembly (centre in picture), here’s an action you can take to help create “genuinely” affordable homes in MK today. We urge you to email a comment to MK Council’s Affordable Housing consultation by this Friday 27th April. Need for more diverse variety of housing tenure (include community-led housing models, CLTs,, co-op housing, coliving, cohousing etc) and include this into your affordable housing percentage to create “genuinely affordable” housing. Priority of land allocation to be made available for community-led housing groups & self-build in support of Plan:MK section 7.43 (policy HN5). 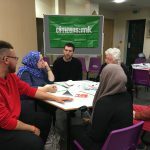 In Spring 2018, Citizens:mk’s Mental Health campaign team conducted a survey to find out about experiences of Improving Access to Psychological Therapies (‘IAPT’) among Muslim and LGBT+ communities in Milton Keynes. 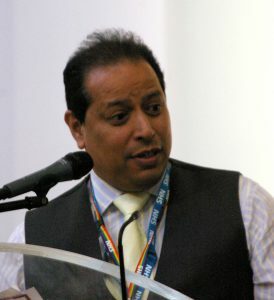 This research was supported by Tyrone Blackford-Swarries, Director of MK Mental Health Services (pictured at the Citizens:mk Accountability Assembly last year), who is interested to know why some communities are less likely to undertake IAPT assessments than others. 73% said that, if they needed a Mental Health assessment, they would use the IAPT service (12% knew the meaning of ‘IAPT’). Two respondents (6%) gave ‘fear of bullying/prejudice/racism/sexism’ as a reason for not using the service. Two said they were unable to face a phone assessment. 88% said they were more likely to request and attend a face-to-face appointment if offered one in a location of their choice – 78% expressed home as a preference, 42% the Hospital, 30% Q:alliance meeting place). 76% would take up the offer of a psychological therapy service. Contact details were provided by 36% of respondents from Muslim communities and 3% of respondents from LGBT+. These results will be discussed with the IAPT Team to explore policy implications. Members of the local community are coming together in their hundreds at a Citizens:mk election assembly event to voice their concerns to would-be decision makers in order to improve the lives of poor and disadvantaged households including children and their families across the borough. Fidele Mutwarisibo of The Open University will call for Restorative justice for the victims of hate crime and more action on removal of hate graffiti. Others will call for action on Life Skills for Young People and Mental Health. The leaders of MK’s main political parties will respond, also the Police Area Commander and other power-holders. Powerful stories will be heard on stage from individuals who are directly affected by a shortage of housing in the city, difficult access to mental health services, lack of finance education in schools and hate crime on the streets of MK. A school choir will sing about the city they want to grow up in. 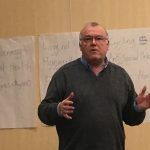 Rev Tim Norwood, Area Dean and Co-Chair of Citizens:mk said: “We have planned this assembly to highlight the issues that matter most to people living in the borough ahead of the local elections with urgent asks on homelessness and hate crime. Book places here or call 07962 838685 if you have any questions. Celebrate the achievement of MK Homelessness Partnership producing its first MKHP Strategic Review Dec 2017 and MK Council approving a new Rough Sleeping Reduction Strategy to reduce the number of people sleeping rough to zero by 2021. Collaborate in building power to support MK Council and MK Homelessness Partnership in achieving their goals. First, at lunch time, pupils from three local primary schools enjoyed a facilitated Q&A session with four people who have experienced rough sleeping. Click here to see what happened. At 7.30pm, guests had an opportunity to quiz those in positions of leadership in addressing homelessness: Cllr Peter Marland, Leader of the Council; Gamiel Yafai, Chair of MK Homelessness Partnership; Simon Green, CEO of YMCA MK; Lawrence Morgan and Suzanna Raymond of the Citizens:mk House the Homelessness campaign. Guests enjoyed asking questions about the recommendations in the Strategic Review and their personal experiences of developing and delivering them (Cllr Marland pictured below). At 9pm, 55 guests attended a House the Homeless Assembly at which Gamiel Yafai received a Citizens:mk Gold Award for MK Homelessness Partnership (pictured below) for developing a strategy with the goal of ending homelessness in MK. Towards the end of the Assembly, a film was shown of Summerfield School Choir singing a song about homelessness, ‘We Will Fix You’. After the Assembly, Ian Roberts and band played live music to entertain Sleep Easy volunteers as they prepared to bed down in the cold to raise money for YMCA. Although the temperature didn’t get below freezing until 6am, the one-night volunteer ‘rough sleepers’ felt the chill and discomfort of sleeping rough in winter. Click here if you would like to contribute to their fund-raising. 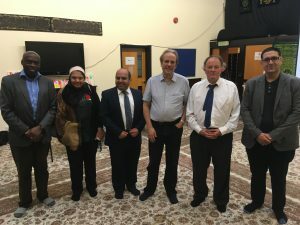 Truby’s Garden Tea Room, sponsored by Meals by Malik – a local Muslim Woman caterer) and the owner of a small Muslim led printing company Good Response, provided meals for those sleeping out and refreshments for those attending the Assembly. Click here for link to recent MKFM radio interview with campaign leaders. 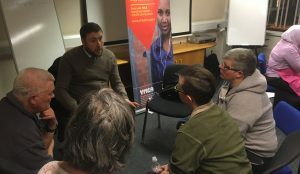 At lunchtime on Friday 16th March, 16 pupils from three member primary schools visited YMCA MK to meet and interview four people who have direct experience of sleeping rough. 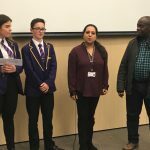 The aim of the event was to give the pupils a chance to get answers to some of the questions they had in researching for the House the Homelessness campaign, launched by Citizens:mk in February. “This will inform our fundraising and awareness raising efforts,” said Rob O’Malley, Head teacher of St. Monica’s Primary School. To find out more about the Day of Action on Homelessness 16th March, click here. On Tuesday 13th March, campaign leaders met Cllr Peter Marland, Leader of MK Council, in his office. First the pupils of three member schools – Jubilee Wood Primary, Summerfield Primary and MK Academy – presented evidence of their frustration that MK Council has still not provided a list dates for the scheduling of improvements to the Redways as part of his commitment to the Redways Relaunch campaign. Cllr Marland agreed to arrange a meeting with the acting Head of Highways and report to the Citizens:mk Accountability Assembly on 24th April. 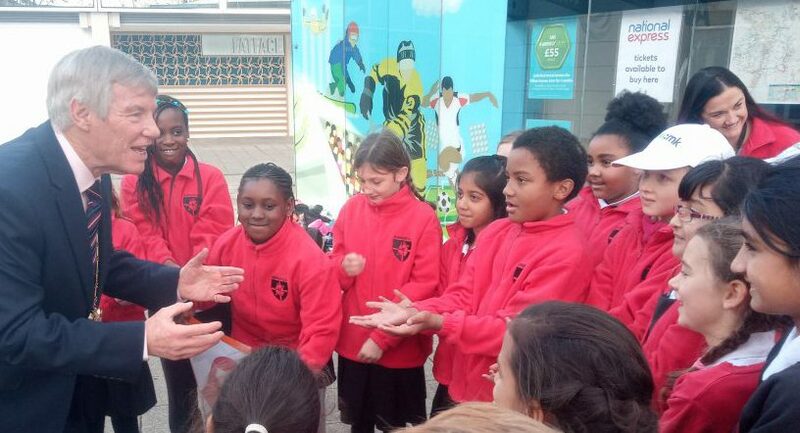 Then the pupils of Jubilee Wood Primary School shared their feelings about seeing rough sleepers in MK, stating that it made them feel “sad”, “guilty” and “disappointed”. Lawrence Morgan, leader of the House the Homeless campaign, secured a pledge from Cllr Marland to attend the upcoming House the Homeless Assembly on 16th March and formally agree there to partnership in this important campaign (pictured below). 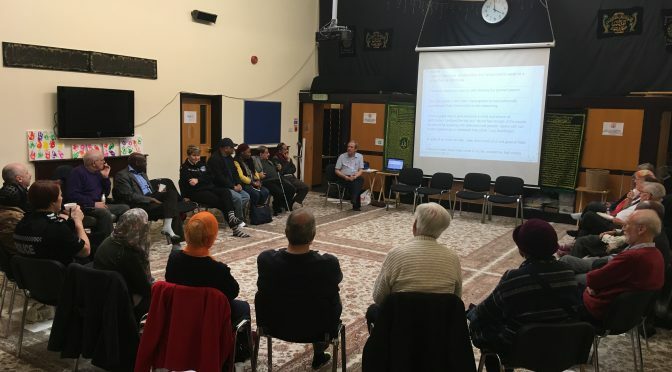 At Acorn House on 12th March, 19 people (pictured) attended a Restorative Justice workshop hosted by Police Area Commander Yvette Hitch and led by Ann Jansen-East of Thames Valley Restorative Justice Service. 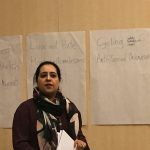 The workshop focused on what works in restorative justice, featuring powerful testimony from two women with direct experience of the process following abusive relationships. Testimonies were also provided by Arif Masters of Zainabiya Centre and Cory Bond, formerly of YMCA MK. 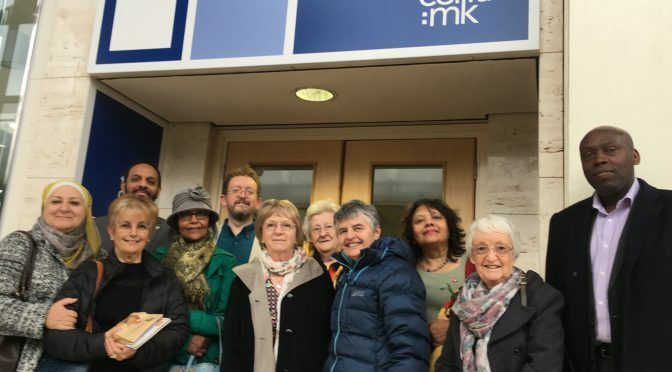 meet with members of the Citizens:mk Fight Against Hate campaign team to discuss the costs and benefits of growing police use of restorative justice in MK, especially looking at what has not worked in restorative justice approaches elsewhere and what could be done differently in the MK context. attend the Citizens:mk Accountability Assembly on 24th April (if available). Future discussions will include examination of what does not work in restorative justice and what could be one differently in the MK context? 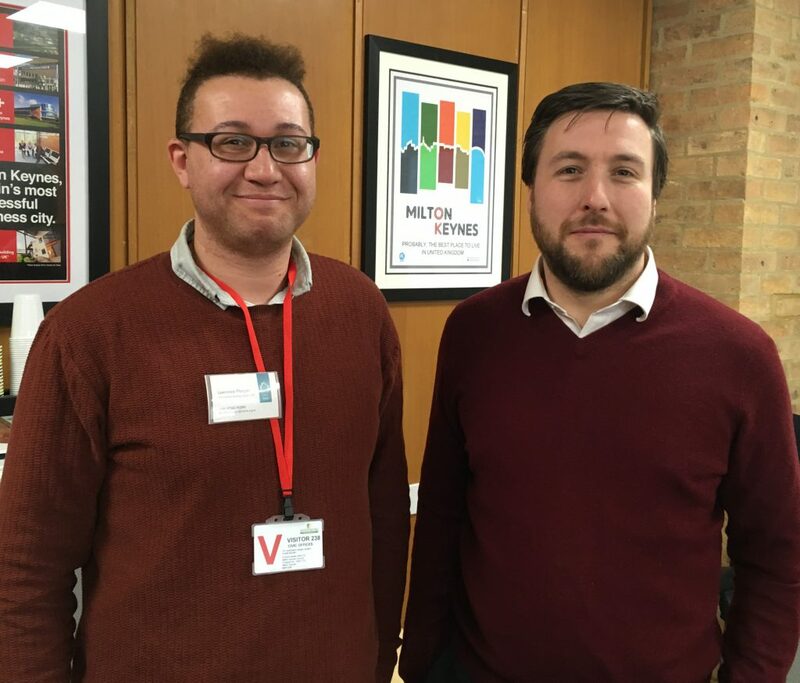 As a first step towards the primary goal of our new House The Homeless campaign, Citizens:mk leaders have met with the Chair of MK Homelessness Partnership (MKHP) and agreed to work together. 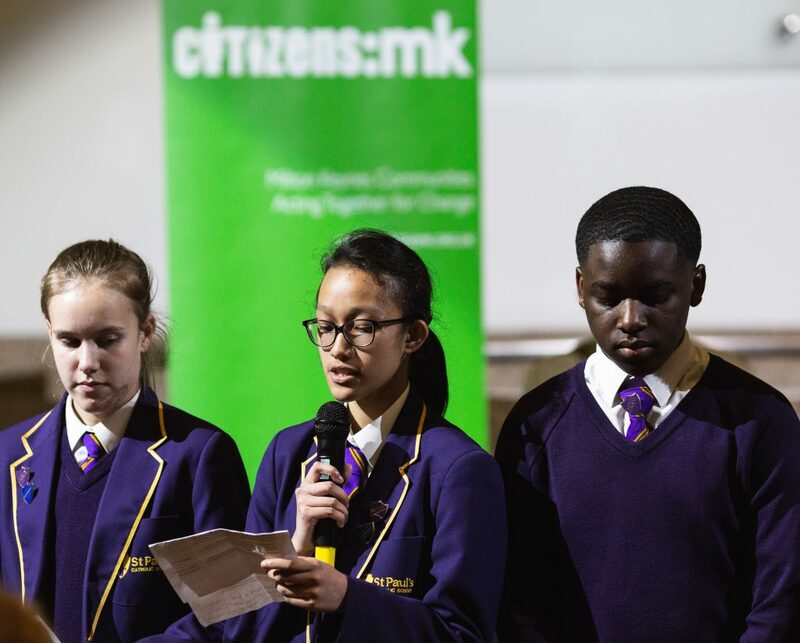 At a special night-time assembly on Friday 16th March, Gamiel Yafai will receive a Citizens Gold Award for MKHP’s inspiring achievement in producing a Strategic Review to shift MK ‘from managing to ending homelessness’. 98 people from 13 Citizens:mk member institutions have pledged to attend. Click here to come too. MKHP is the Partnership through which MK Council has worked for 18 months with local homelessness organisations including Winter Night Shelter, Open Door, MK Bus Shelter and YMCA MK. 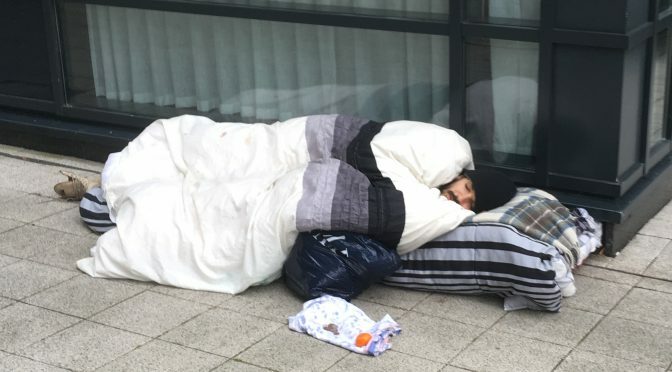 Its mission is supported by all political parties on MK Council which, while managing the pressures of a greatly reduced budget, has agreed substantial funding to address the issue and end homelessness by 2021 (see recent BBC report). This year’s annual ‘Sleep Easy’ sleep out will take place in the Fred Roche Gardens behind the Church of Christ the Cornerstone, Central Milton Keynes. To furnish the bedrooms in our new building, which is due to be complete by June 2019 . To raise funds to allow us to continue with our learning and support programme, because, as you will be aware, funding from local government has drastically been cut, it is therefore vitally important that we fundraise to continue with our work with the help of organisations such as yourself , supporters of the YMCA and the local community. For further information, click Sleep Easy booklet 2018. To register to join the Sleep Easy sleep out, click here. There is a small fee which will cover the cost of hot drinks, soup & rolls, and a breakfast bap the next morning. Please register and help us to reach our Sleep Easy Fundraising target of £10,000. For those who are unable to sleep out, but are intending to come to the Assembly on the evening, please advise Paul Griffiths. LGBT and minorities – standardise gathering of data to identify the true number of homeless people including LGBT and minorities. These draft goals, perhaps with others, will be considered at a further meeting on 23rd January, 5-7pm, at Acorn House. Meeting participants gave a score of 8/10 for the meeting. 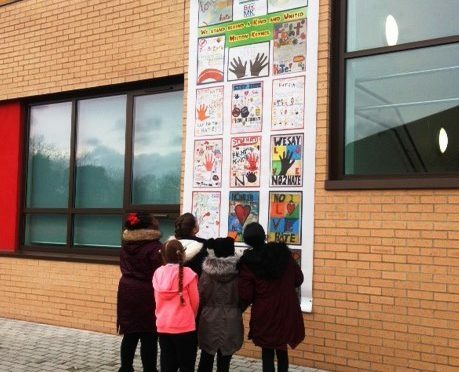 Following the launch of the Fight Against Hate campaign poster display on the front of Church of Christ the Cornerstone last month (see news story), the banners have been moved to Jubilee Wood Primary School. The photo above shows pupils chatting about the display a few hours after its arrival. It is expected that more than 600 people – school pupils, parents, staff, governors and visitors – will pass the display in the next few days. The posters will be displayed here for a while, before moving to other participating primary schools across the city. Ten leaders from seven institutions attended the first of three Twilight Training sessions following Two-Day Training 6-7.10.17. 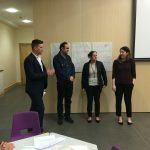 The aim was to develop power analyses for each of the main issues prioritised at Leaders Forum on 14.11.17 – Homelessness & Housing, Mental Health & Isolation, Young Voices and Life Skills. 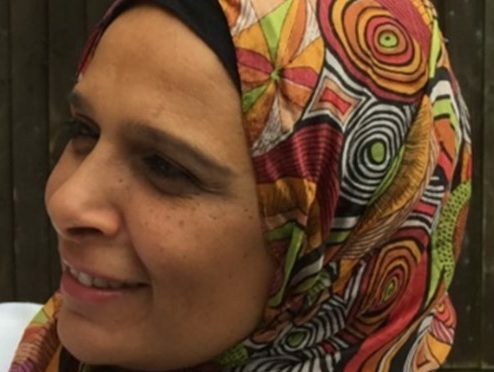 30% increase in ‘My motivation to make positive change in my community’. 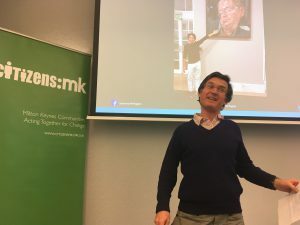 “(The training had) lots of different tools and ideas that can be of great value,” said Jean-Louis Bretton, attending his first Citizens:mk training session. Plans were made for 121s with key individuals who might provide powerful testimony and help to create SMART campaign goals ready for presentation to Delegates Assembly on 5.2.18. The first meeting for campaign teams will be held on Tuesday 12th December, 5-7pm, at Jury’s Inn. 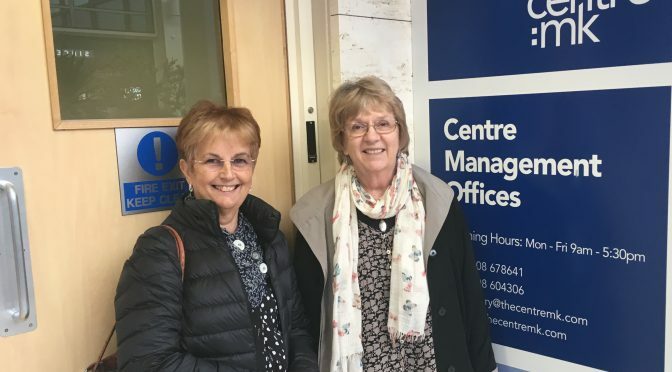 In a small action towards the target of MK50 Living Wage accredited employers, campaign leaders Debbie Wilson and Sheila Bacon (pictured) followed up last week’s action by meeting with OCS Group UK Ltd manager Roger Young. Mr Young confirmed that OCS Group UK Ltd is already an accredited Living Wage employer and said he would do what he could to ensure that all contractors with thecentre:mk were also accredited, so that thecentre:mk can be recognised and celebrated as an accredited employer…hopefully before the end of 2017, MK’s 50th birthday! 11 leaders from seven member institutions took action to get the management of Thecentre:mk talking about the Living Wage. 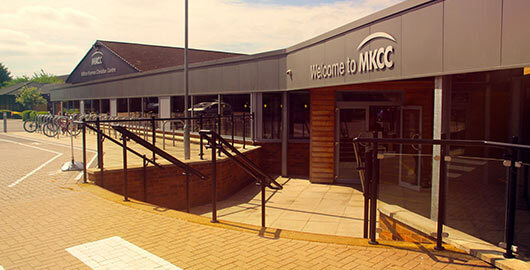 Thecentre:mk is one of MK’s most famous institutions, defining in part at least our very culture as a community. MK’s largest building, it was opened by PM Margaret Thatcher in 1979 and today attracts 27m shoppers to MK each year from around the region. Earlier this year, it was announced that thecentre:mk will undergo a £50m revamp. 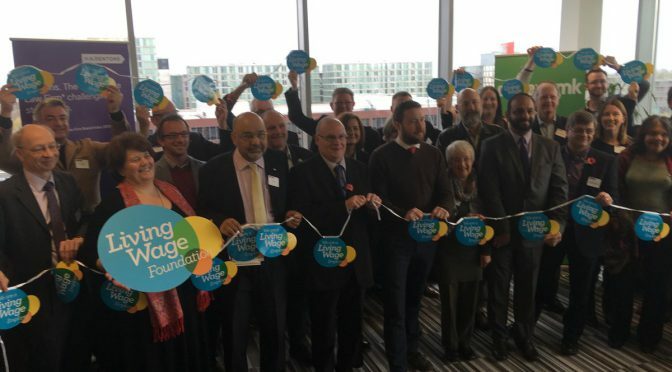 Citizens:mk’s Living Wage campaign team has been working for more than five years to drive up the number of MK employers who are accredited Real Living Wage employers, i.e. those who are committed to paying all staff and contract workers at least £8.45 per hour (the wage independently calculated to be what is needed for a decent standard of living). And with some success…48 employers have been accredited so far (see list of MK fair employers). 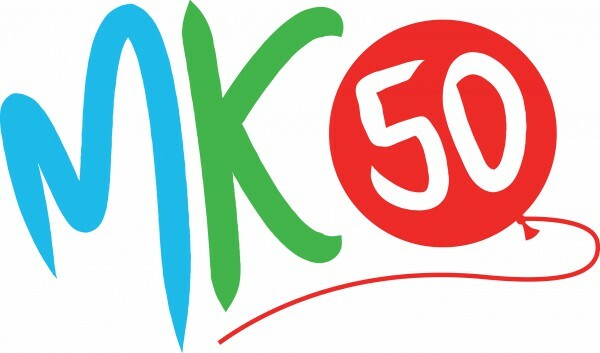 But the campaign’s target was 50 by the end of 2017, to celebrate MK’s 50th birthday. The Living Wage campaign team wanted to show thecentre:mk the various benefits of being a Living Wage Employer. Led by Debbie Wilson and Sheila Bacon of MK Quaker Meeting, with the help of Kurshida Mirza and Ayser Al Jawad of Truby’s Garden Tearoom and the Middle Eastern Cultural Group, the team finally got a face-to-face meeting with thecentre:mk’s administrator, Debbie Stevens, which led to a meeting with CEO Kevin Duffy. Mr Duffy is concerned that accrediting thecentre:mk as a real Living Wage employer will give the public the wrong impression that all retailers in thecentre:mk are all accredited. Thecentre:mk is jointly owned by Hermes Real Estate Investment Management Ltd and AustralianSuper Pty Ltd and managed by CBRE Ltd.
MK businsess leaders met to celebrate reaching 48 of a campaign target of ’50 MK employers accredited by the Living Wage Foundation in 2017, MK’s 50th birthday’. See list of MK’s Real Living Wage employers. More than 1,500 MK employees have received a pay rise as a result of our Living Wage campaign so far. The breakfast event was hosted by Dentons UKMEA LLP and attended by 46 adults plus the Summerfield Primary School choir. The choir performed its new Living Wage song led by teaching assistant and composer, Nikki Elgar, See video of recording on 12.10.17 (pictured below). Lola McEvoy from Living Wage Foundation spoke about the Future of Living Wage, and the event ended with Summerfield Primary School Choir singing ‘We Built This City Called Milton Keynes’. Guests were then invited to join the campaign team in an action to present a letter to thecentre:mk management asking for a discussion about Living Wage accreditation. It is hoped that two more MK employers will be recruited to become accredited Living Wage employers before the end of 2017,. 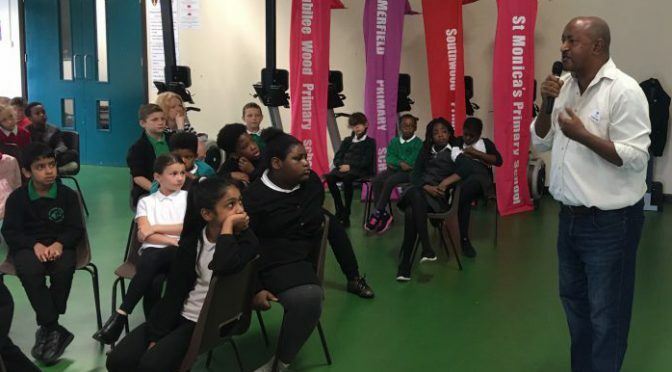 Three volunteers from Network Rail visited Summerfield Primary School to hear from pupil councillors what issues had been raised in the school’s recent listening campaign. 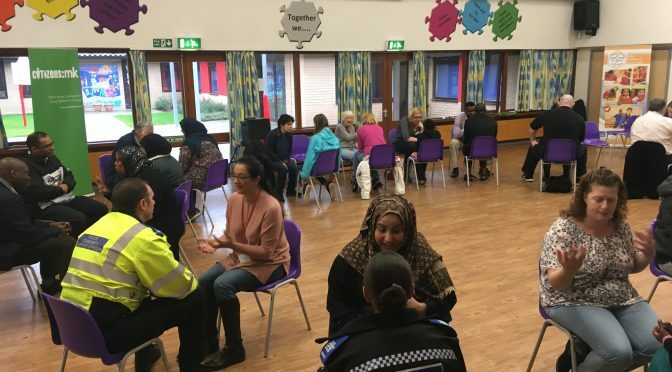 Then they returned to Network Rail to undertake some one-to-one meetings with colleagues and find out what community issues they were concerned about. The three Network Rail staff were Taiwo Adesanya, Gullemo Porras and Tolu Adewole. They discovered that their colleagues had very similar concers to the children: redway safety and homelessness. The children pledged to include this in their report to Leaders Forum on 14th November. 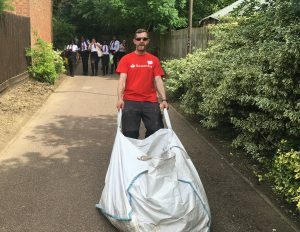 After meeting with the School Council, the three Network Rail staff volunteered to help 40 Year 5 pupils with a litter pick on the redways surrounding the school. Pictured below is Tolu (far left) with some of the pupils. 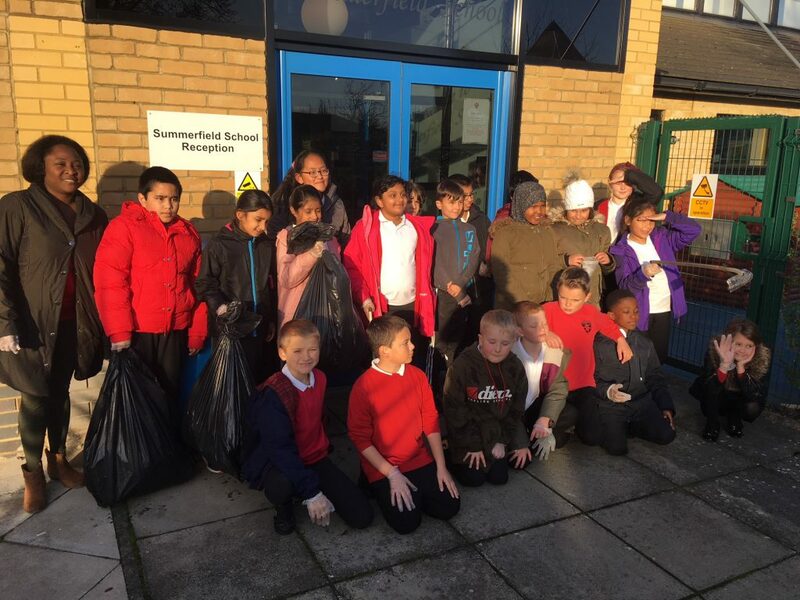 “The redways are much freer of litter than before we began this campaign,” said head teacher Pam Weston. It is encouraging that so few of us have personally experienced hatred and we must not allow ourselves to be overwhelmed and become despondent by negative news stories. On the other and we were a self selected and somewhat privileged group. We may be living in a bubble. How do we engage more marginalised people? We cannot afford to sit on our hands. Someone referred to Martin Niemöller’s poem pointing out that if we don’t stand up for those who are oppressed then in the end no one will be left to speak for us. Click here for full list of text insights. Standing below are the organisers. Children from Summerfield Primary School sang to the chief police officer and other city leaders at the city church in a plea for more action on hate crime. 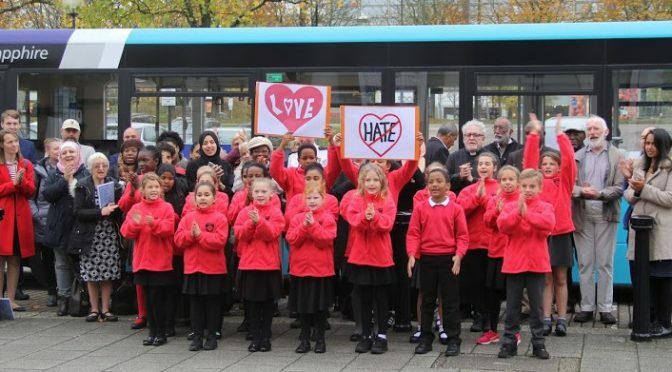 In a day of action organised by Citizens:mk, as part of national Hate Crime Awareness week, the school choir sang a specially composed song, ‘Love is stronger than hate’. See video. 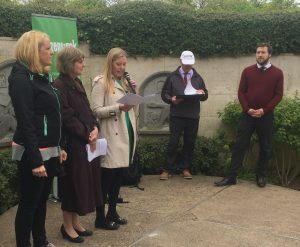 Clapped on by 75 supporters from 16 MK faith, education and business organisations, the song helped to secure specific pledges of further action from city power-holders. 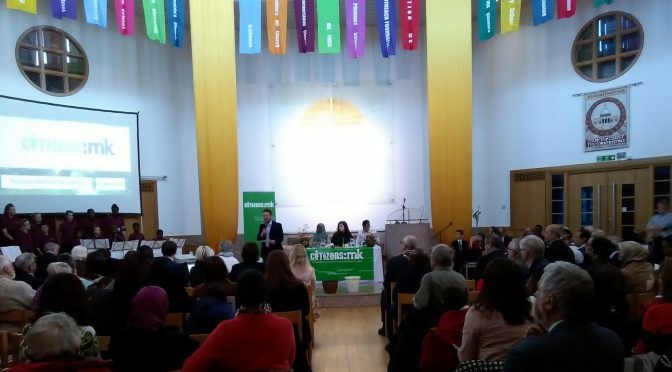 Earlier the audience heard a series of testimonies from victims of hate crime, including male and female muslims who had experienced Islamophobic hate against them and a gay man who had been assaulted in a club for dancing with his partner. of race-based hate crime in Milton Keynes since 2015. 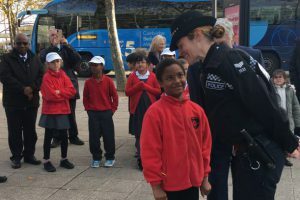 After the children’s song, Yvette Hitch, Superintendent LPA Commander of Thames Valley Police (pictured below), pledged to organise a workshop on restorative justice and nominate a liaison officer to monitor and meet with Citizens:mk quarterly. Hannah O’Neil, Deputy Leader of the Council, pledged to host two Healing through hearing events for victims of hate crimes and send two representatives to the new restorative justice workshop. As part of the Day of Action, two large banners featuring the children’s ‘love is stronger than hate’ posters, were hung from the front of Church of Christ the Cornerstone. The Rev John Robertson, Director of MK Mission Partnership, officially unveiled them. 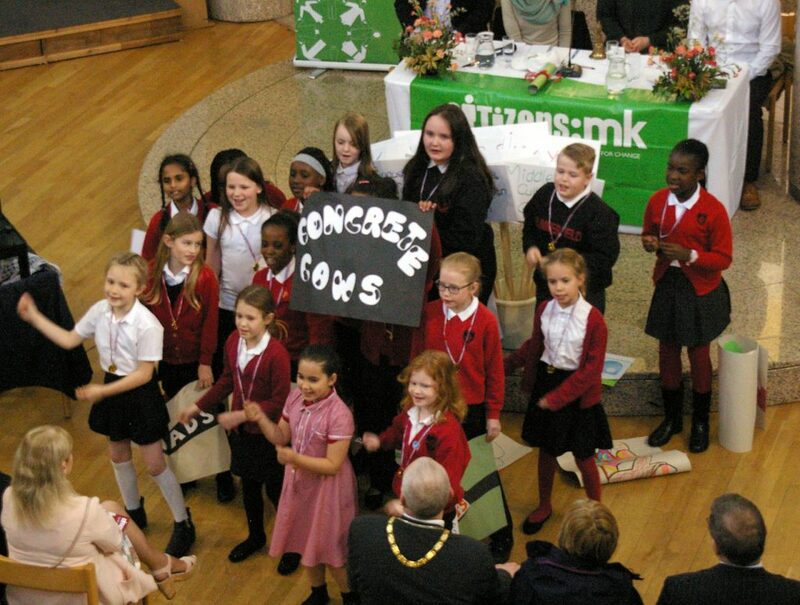 Click here to hear ‘Love is stronger than hate’ by the choir of Summerfield Primary School. Click here for Fidele’s experience. Click here for Nikki’s experience. For further information about the Citizens:mk Fight Against Hate campaign, click here. I loved the Fight Against Hate action day that I attended and found it a hugely motivational and positive event. 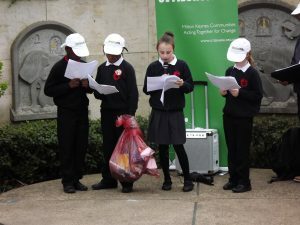 It was great that the children were so involved too, not only when singing the song, but when they had the opportunity to question and listen to others and share their own experiences of hate. 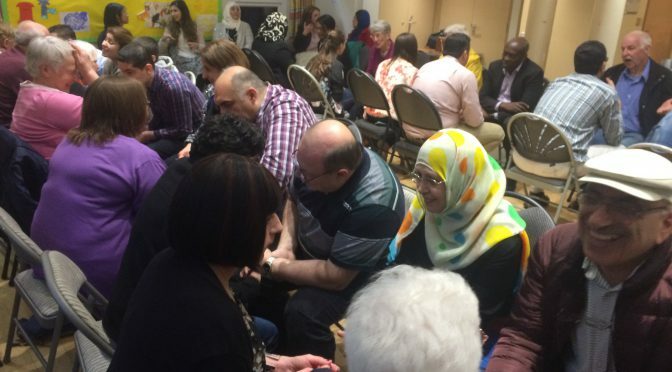 It was particularly beneficial for them to hear from other people’s experiences as this helps them to understand that words and actions have consequences but also that they are not alone if they have experienced hate directed at them. 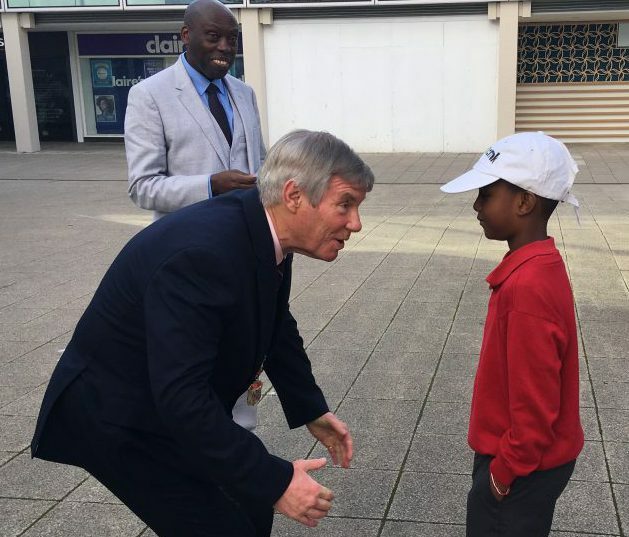 Following on from my Leadership Training with Citizens MK, the importance of reaching significant power holders was demonstrated at the action day when pledges were made by people in power to support the anti hate campaign. This also showed the children how powerful we can all be in making a change and working together. When writing the Love is Stronger Than Hate song, I really wanted it to highlight that differences are not reasons to divide and that all our friends are different from us but fundamentally we all want and need the same things. We are responsible for our feelings and actions and, by working together, we are powerful enough to make changes without pointing blame at others. When we are young, many of our thoughts are shaped by others’ opinions so it is important for children to question things and really recognise that hate is due to lack of understanding and isn’t based in fact. The children love singing and I love writing songs and lyrics to teach them about their world and what a positive impact they can have. Listen to ‘Love is stronger than hate’. 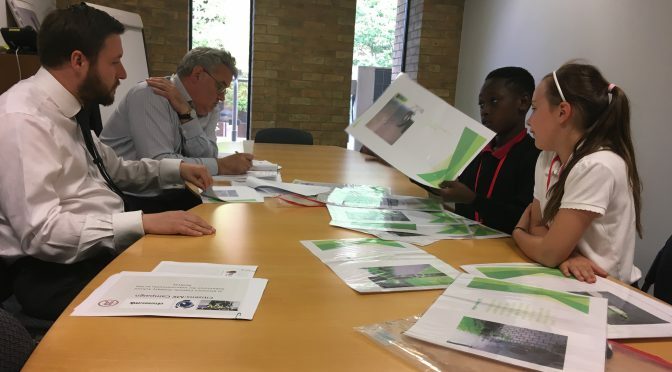 Three students from MK Academy attended a meeting with MK Council’s Head of Highways, Sean Rooney, to check on the progress of his pledge to produce a list of dated improvement projects early this term. Sean Rooney said the list hadn’t been finalised yet, but would be sent over by 16th October. Sean and his colleagues showed the students around the Ringway site which maintains the vehicles and other equipment which keeps MK’s roads safe. 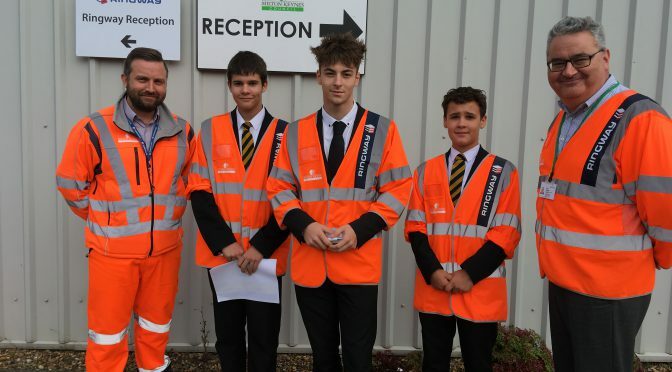 Pictured are students John, Tomasz Wisniewski and Harry Smith, with Gary Thorn of Ringway (left) and Sean Rooney of MK Council (right). 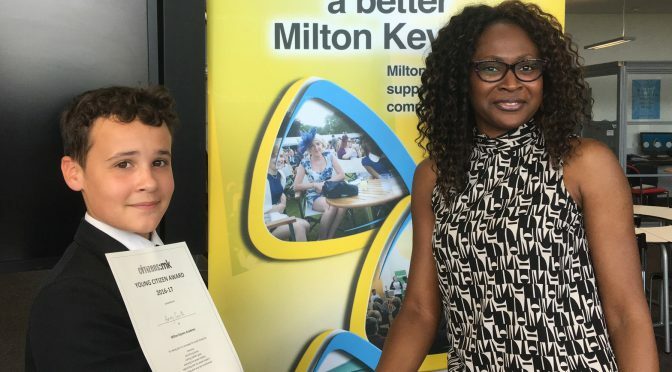 Taiwo Adesanya, Management Accountant of Network Rail, recently visited MK Academy to congratulate two pupils on receiving their Young Citizen certificates. Student Harry Smith (pictured with Taiwo) was commended for his co-leadership of the Redways Relaunch campaign during 2016-17. Taiwo pledged commitment to organising a team of Network Rail staff to volunteer a day of clearing and cleaning the Redways around the school in October 2017. 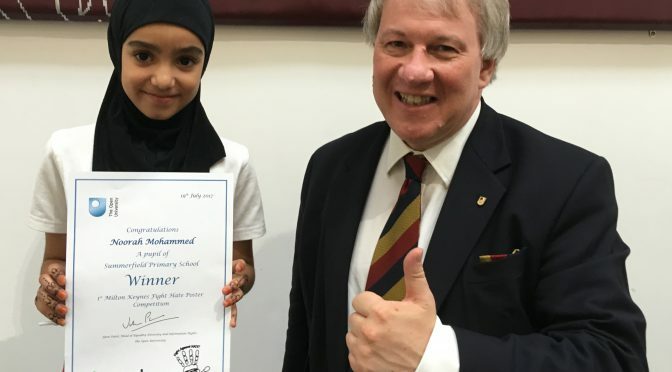 Noorah Mohammed, Year 5 pupil at Summerfield Primary School, has been awarded first prize in the ‘Fight Against Hate’ campaign poster competition. The runners up were Frankie O’Connor of Great Linford Primary School and Fariss Kapaga, also of Summerfield School. The competition was sponsored by Arriva Buses, represented by General Manager Kieran Lawson, and The Open University, who hosted the awards event. “We are proud of what the pupils have done to raise awareness of this very important issue,” said Lucian Hudson, the OU’s Director of Communications. 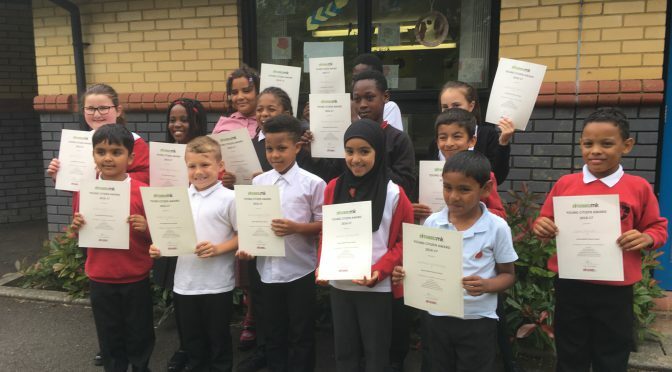 Five primary schools brought pupils who were shot-listed for an award: Great Linford, Jubilee Wood, St. Monica’s, Summerfield and Tickford Park. The Summerfield children’s choir sang ‘We Built This City Called Milton Keynes’ and a specially commissioned new song, ‘Love Is Stronger Than Hate’. Click here to hear Nikki Elgar and the Summerfield School Choir on BBC Three Counties Radio (1hr 50mins and 44secs into the show). “We’re all different but we’re all the same on the inside,” said Nikki Elgar of Summerfield School. Pictured above are Noorah and Lucian Hudson, who presented the award. Pictured below is the Summerfield School choir in full voice. Seven pupils from three schools attended a second meeting with Cllr Peter Marland, Leader of MK Council, and Sean Rooney, Head of Highways. Also attending were David Foster and Rob Riekie, Chief Executive and Operations Director of The Parks Trust. This was the second formal meeting between pupils and the main power-holders in Citizens:mk’s Redways Relaunch campaign. The schools represented in the negotiations this time were MK Academy, St. Monica’s and Summerfield Primary School. 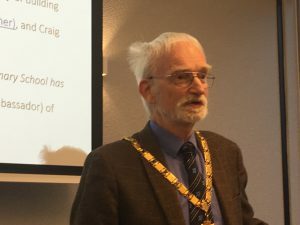 Sean Rooney explained that his team had been researching the feasibility of the Redway improvements proposed by pupils at the last meeting, and that most would be implemented. The changes will include new lamp posts, clearing bushes and applying new surface treatments. He said these would be detailed in a RAG-rated list, including improvements on Parks Trust land, and this would be shared with the schools for accountability. Sean Rooney pledged that works would begin this summer and some of the new lamp posts would be ready this autumn. 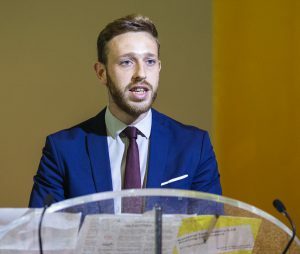 He also proposed that pupils could design with individual school branding the heavy-duty stickers that would be used on lamp posts to identify the relaunched Redways surrounding each school. 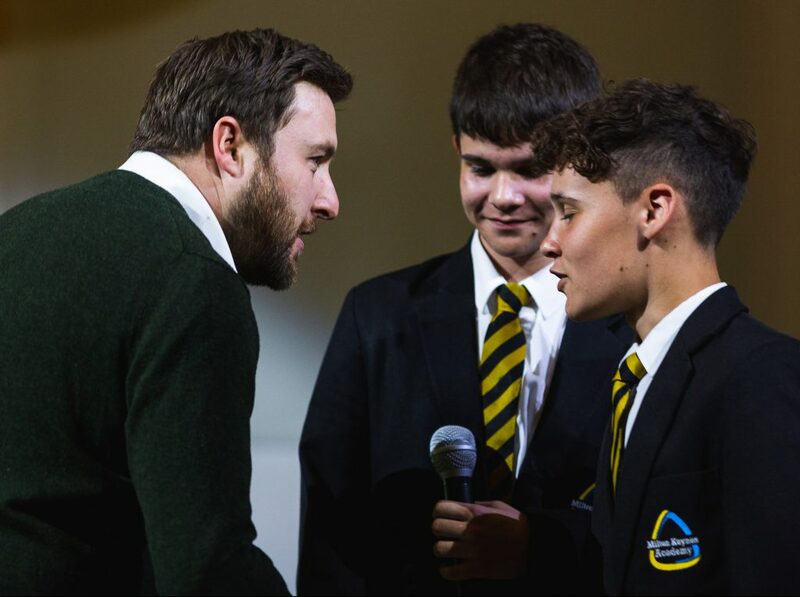 “We have listened to you,” he told the pupils, “and we need to keep on listening”. Councillor Marland said: “The 50 improvements you want could be 500 improvements if we involve other schools and some of the businesses you are working with.” Various business partners are already engaged in the campaign – Dentons, Network Rail, Santander, Shoosmiths – and the meeting agreed it would be good to engage them further. “Let’s do this across MK,” said David Foster. 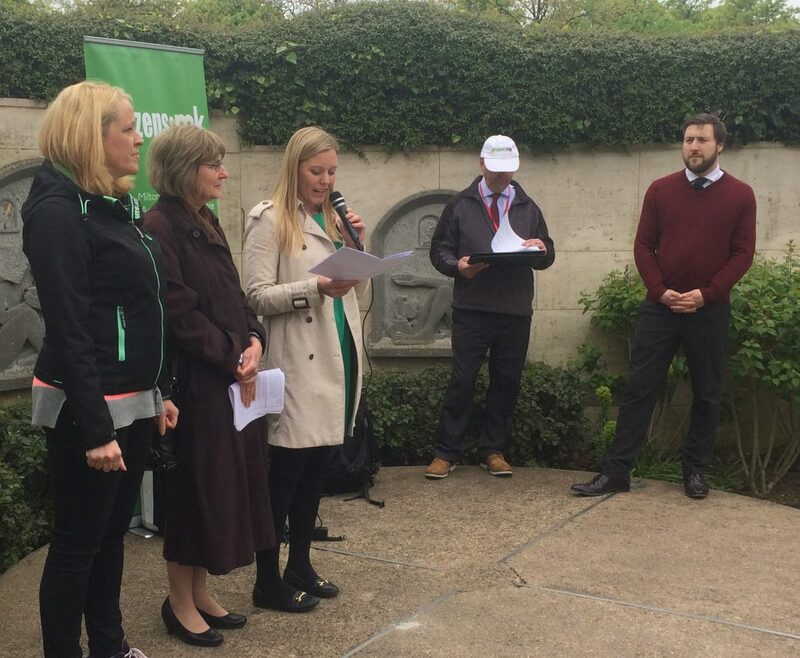 “It’s unusual to hear directly the voices of young people…and we want to hear more of them.” Rob Riekie offered that Parks Trust staff could walk with pupils around the Redways on Parks Trust land to look at other ways they can be made safer. “Talking to these important people has helped me become more confident,” said 11-year-old Miriam from St. Monica’s Catholic Primary School. “It’s clear that they’re taking us seriously,” said 14-year-old John from MK Academy. 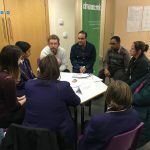 Roz Mascarenhas from the Youth Participation Team of MK Council invited Citizens:mk’s Mental Health campaign team to lead a Mental Health workshop at the MySayMK Conference for pupils from local secondary schools. The conference was held at MK Christian Centre in Oldbrook (pictured). The workshop was facilitated by campaign leader Tess Price and two new team members, Brett Farrier-Smith and Laura Gaskell from the YMCA, along with Community Organiser Tom Bulman. The workshop was delivered twice to a total of about 50 young people aged 11-16. Treating everyone the same, in school and outside school, so that young people don’t feel further isolated/stigmatised by their mental health needs/issues (9). 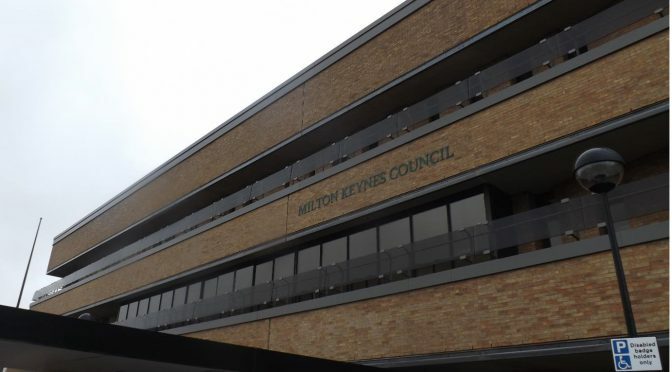 It was agreed that the outcomes would be shared with MK Council and other stakeholders including the Joint Commissioner for the Clinical Commissioning Group and the Director of MK Mental Health Services. From 12th to 19th July, The Open University is hosting an exhibition of children’s art work to raise awareness of hate crime. 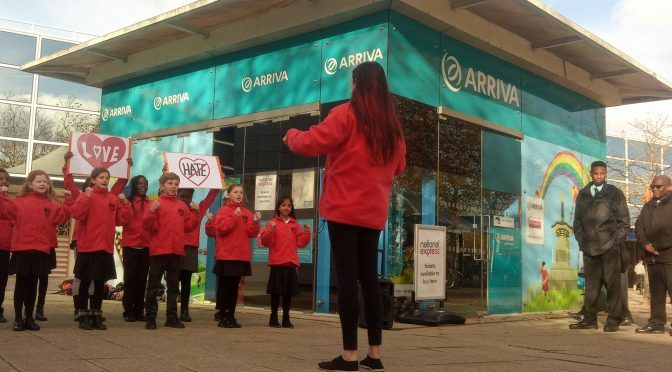 In a campaign organised by Citizens:mk, posters created by pupils from four MK primary schools will be judged by a panel including Arriva buses, whose marketing manager has agreed to display Fight Against Hate posters on MK buses this Autumn. The poster competition was launched by the Bishop of Oxford in May. At the competition awards event on 19th July, the Summerfield School choir will perform a song written especially for the campaign, ‘Love not hate’. Prizes for competition winners include Apple computers. To see and hear the pupils’ views and voices, sign up to attend the Poster Exhibition & Awards event at The Open University on Wednesday 19th July, 10.00-11.30am (arrival from 9.30). Contact Jiten Patel, organiser of the competition, jiten.patel@open.ac.uk . On Wednesday 28th June, two groups of five hate crime survivors met to share their experience and ask one another questions. Among them were men and women of different ages who have experienced hate because of their religion, race, LGBT identity or disability. Running this pilot event was one of the four goals of the Fight Against Hate campaign launched in February 2017. 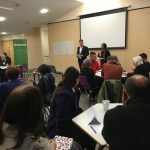 Hosted at MK Civic Offices, and facilitated by two campaign team members from The Open University, the pilot event was seen to be a success because the participants, who had not met before, said they would like to meet again. 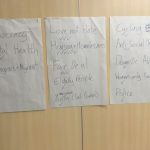 Themes discussed included verbal sexual abuse, bullying/victimisation, isolation, fear for personal safety, anxiety, not knowing where to turn, futility of reporting to police, anger and frustration, inter and intra community tensions and violence. One facilitator observed that people left feeling more supported as a result of having shared. 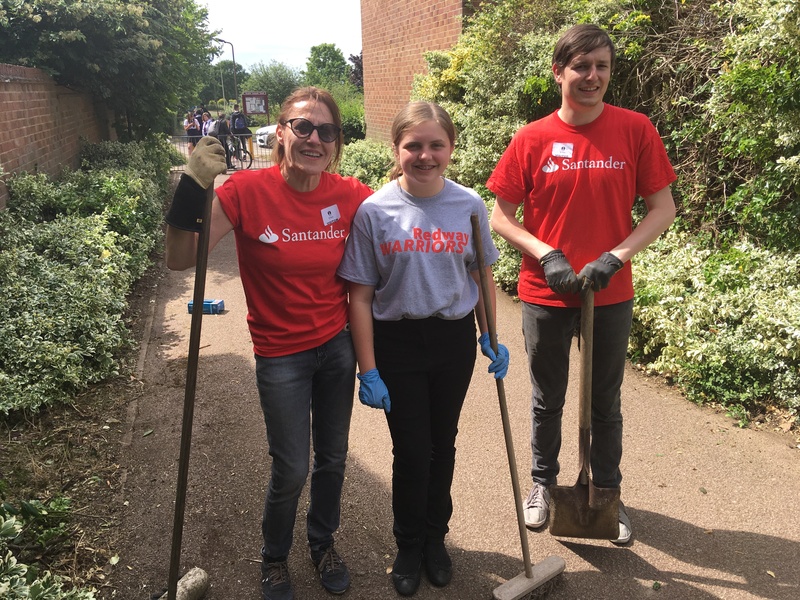 On Monday 26th June, 16 staff from MK’s Santander office spent a full day clearing over-grown bushes from a Redway path used by hundreds of pupils from St. Paul’s Catholic School. 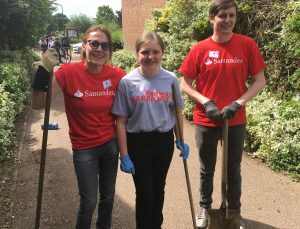 It was part of a ‘Discovery Day’ scheme through which Santander encourage their staff to engage with the local community. 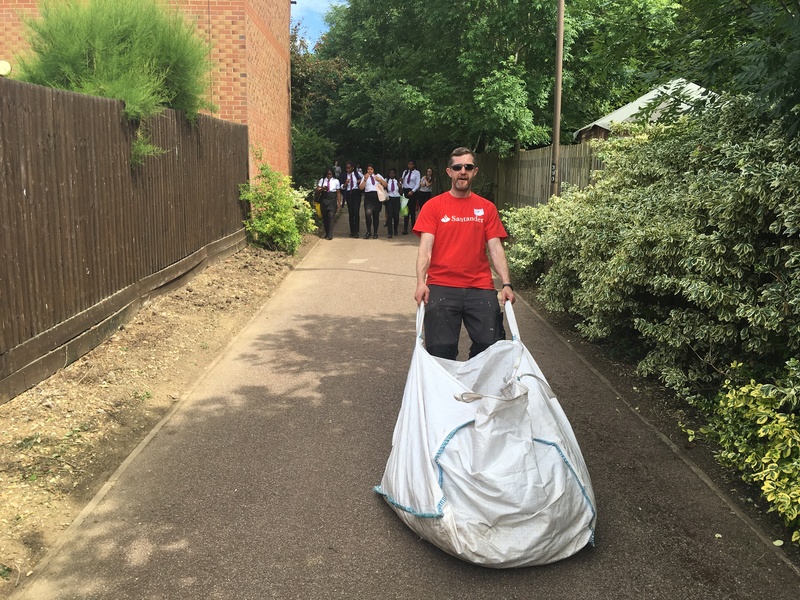 It was also a vital action day for the Citizens:mk Redways Relaunch campaign, with students wearing ‘Redway Warriors’ t-shirts and using litter-picking equipment purchased by Santander. “We’ve coordinated well as a team. 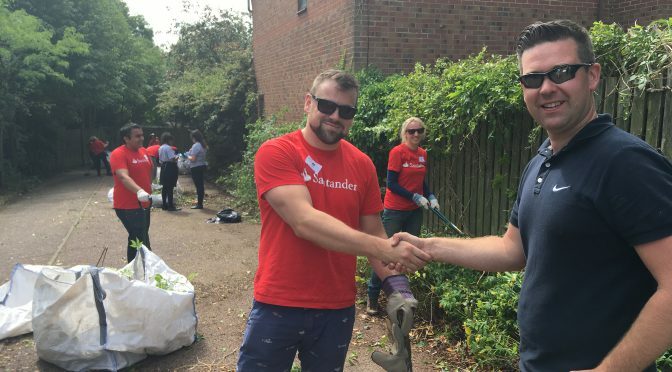 It was so over-grown, litter everywhere!” said Luke Farrell, Contracts Manager at Santander, who spoke at the big outdoor meeting with the Leader of the Council on 21st April. 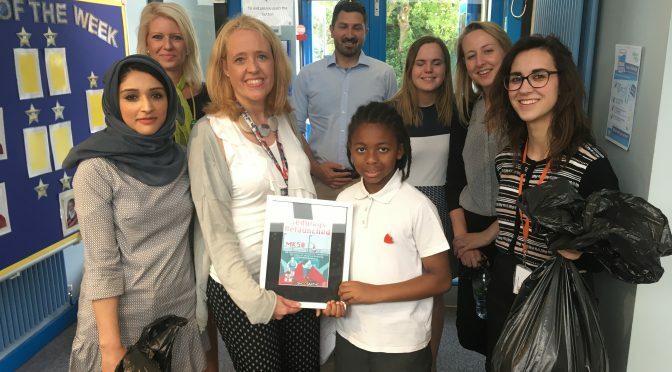 “Working with the St. Paul’s students has been brilliant,” said Karen Robson, Santander’s Head of Third Party Management & Procurement (pictured below with student Tegan Dodimead). Another Santander staff member, Alan (pictured below), was happy to put in the extra effort because he’s training for a triathlon! 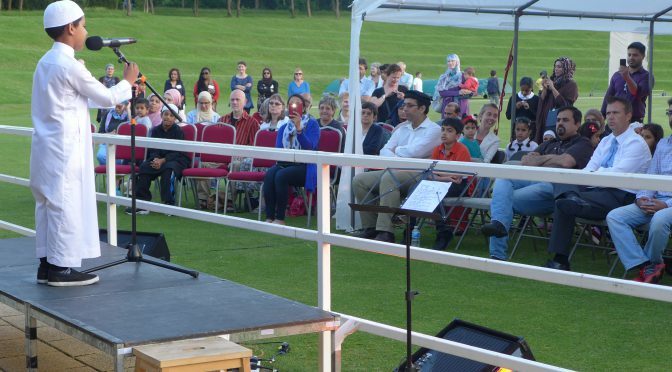 Two member institutions of Citizens:mk, Trubys Garden Tea Room and the Middle Eastern Cultural Group (MECG), teamed up to host a ‘Great Get Together Bring & Share Iftaar’ in Campbell Park Pavilion on Friday 16th June. See video. More than 200 MK residents, including adults and children from all faiths and none, came together to share Iftaar, the breaking of the daily Muslim fast, in a spirit of solidarity. Several non-Muslims, including the High Sheriff of Buckinghamshire, Peter Kara, had a go at fasting throughout the day too. Mark Lancaster MP and the Mayor and Mayoress also attended and spoke in celebration of MK unity. 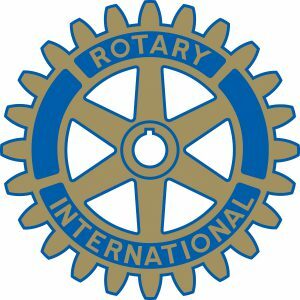 The event was supported by funding from MK Community Foundation and the Rotary Club, with private donations from several individuals. The event formed part of MK’s celebration of its 50th birthday, with a special emphasis on celebrating MK’s unity, justice and welcome to outsiders. 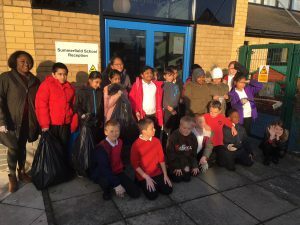 Seven members of staff from Shoosmiths LLP joined dozens of pupils from Summerfield Primary School for 90 minutes of litter-picking on the local Redways. This was another good example of local businesses doing their bit to help Citizens:mk member schools generally, and the Redways Relaunch campaign in particular. This pilot event was planned by the Fight Against Hate campaign in accordance with one of its four main campaign goals. It is not for everyone, only up to 16 survivors of hate crime who have registered interest and been formally invited. 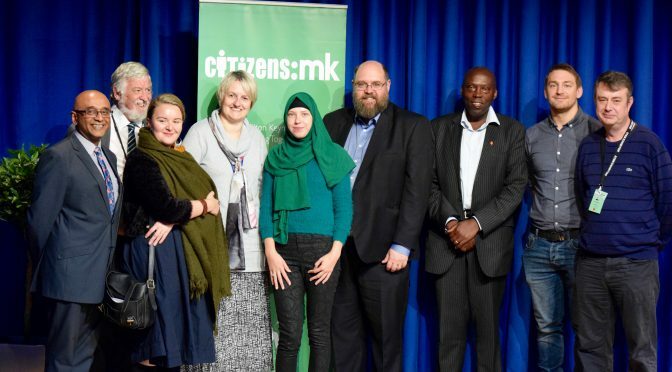 The Fight Against Hate campaign of Citizens:MK won the support of MK Council in hosting a new approach to reducing the effects of hate crime. Hate legislation covers five grounds: race/nationality, religion, sexuality, gender identity and disability. 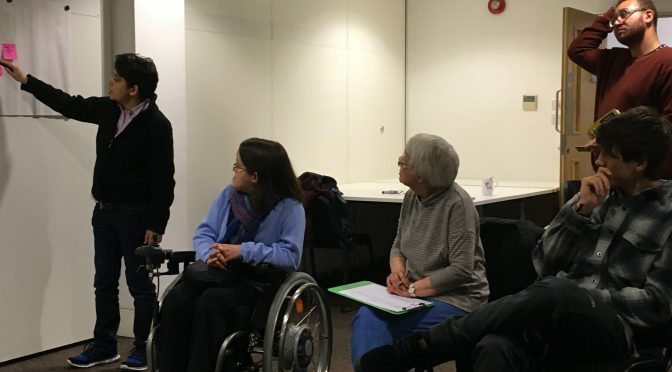 MK Council hosted a twilight session, ‘Hearing through Healing’, to hear the voices of residents and/or those working or studying in Milton Keynes who have experienced some form of hate towards them in MK, no matter how big or small. The aim is to reduce their discomfort by simply giving them the opportunities to listen to each other’s stories about what happened to them. Two small facilitated groups came together to share their stories and be invited to explore feelings and possible next steps. Finally, each participant was invited to say what, if anything they are taking away that may help to re-establish their sense of self confidence and self-esteem. The whole session took 90 minutes. All those participating committed to keeping whatever was said/discussed confidential to the relevant group and nobody’s contribution being shared outside the facilitating group without their permission. This not a counselling or professional therapy session but rather an opportunity for sharing. This event is intended to work through, with diverse and like-minded people who have also experienced hate crime, your reflections of your experience. Using an action learning model the event will give you space to explore issues with the support of an experienced facilitator. The event will also tap into individuals who may be available to answers any of your questions, for example, how are police required to support a victim of prejudice based crime. The event is not there to pre-empt, so what you get out is what you put in, hopefully the attached briefing gives a good overview of what can be expected. The event will be underpinned by friendly, respectful, dignified and fair conversations for all those involved. Any actions arsing from the groups will be required to be actioned by individual members as the event is not geared to advocate or process issues on any individuals behalf. If you require this information in a different format please do not hesitate to ask. We require that you confirm your attendance also commit to confidentiality and consent for generic information to be used in the future. 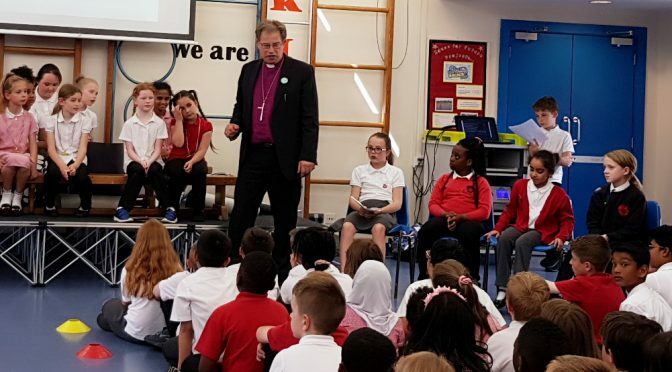 The Bishop of Oxford, Rev Steven Croft, joined other guests from Arriva Buses and Thames Valley Police in an assembly organised by the children of Summerfield Primary School to launch a schools’ poster competition to combat hate. The poster competition has been overseen by the Open University, who have created the rules and will be holding an exhibition of the children’s work from 12th July with an finale Awards event on 19th July. Click here for competition rules. Running the competition was one of the goals set by the Citizens:mk Fight Against Hate campaign which several power-holders signed up to at the 2017 Accountability Assembly. 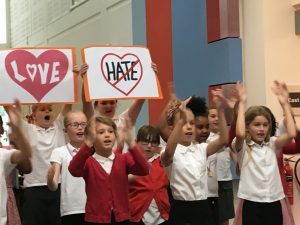 The school choir showed its love of Milton Keynes and desire to support the Fight Against Hate campaign by singing their own song ‘We Built This City’. To thank the guests for attending the assembly, the children gave each guest a box of fresh eggs laid by the school’s own hens – and served them with slices of amazingly delicious cake made with eggs from the hens. 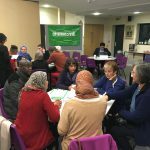 On Friday evening 12th May, 50 people took part in a Weaving Trust event hosted by Middle Eastern Cultural Group (MECG) at Bancroft Community Centre. Click here to see a short clip of Weaving Trust in action. Click here to see the text messages people sent at the end of the session. 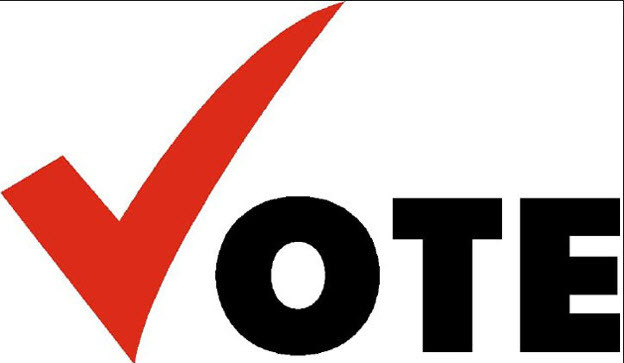 There is a simple Voter Registration form online at www.gov.uk/register-to-vote . If you want to print the registration form itself here’s the link to a printable version, click here. It can work really well to print the forms where you have large groups of people in one place, but remember to collect them all afterwards and deliver them to your local council. If you collect large numbers then it is worth tipping off your local council’s electoral registration office so they know you are coming and they have time to process them. The stumbling block is often that people don’t know their National Insurance number, so it is worth putting some thought into how to get around that. It is possible to submit a paper version with a note saying that they don’t have a record of the NI number, but there is a possibility that this will delay the processing of the form. Though that is better than not submitting anything at all. If you have any questions, contact Tom Bulman, tel 07962 838685. 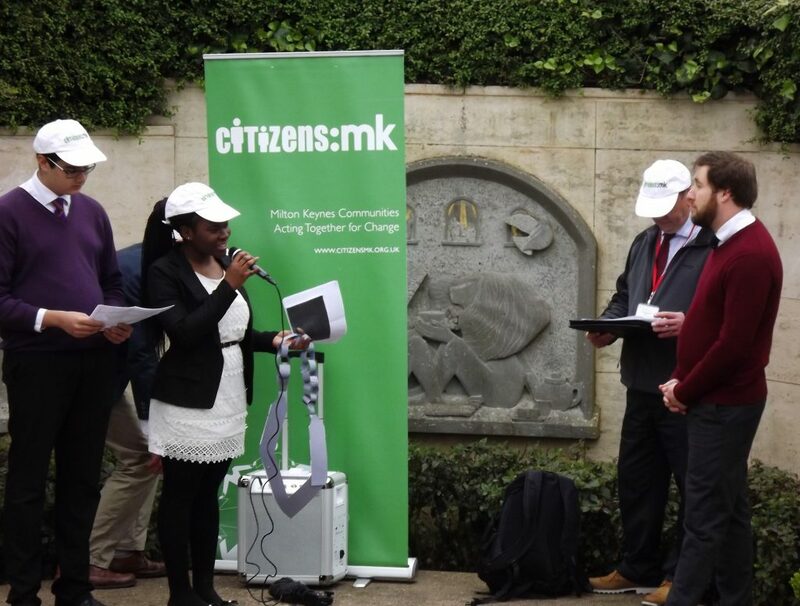 259 individuals from 18 member institutions staked their claim in Citizens:mk for the year ahead and heard pledges of commitment from power-holders to build ‘bridges, not walls’ between MK’s diverse communities in this, its 50th birthday year. Mayor Steven Coventry shook the hands of each member institution’s representative as they came up to call out their institution’s commitment – people brought and dues paid – for the year ahead. 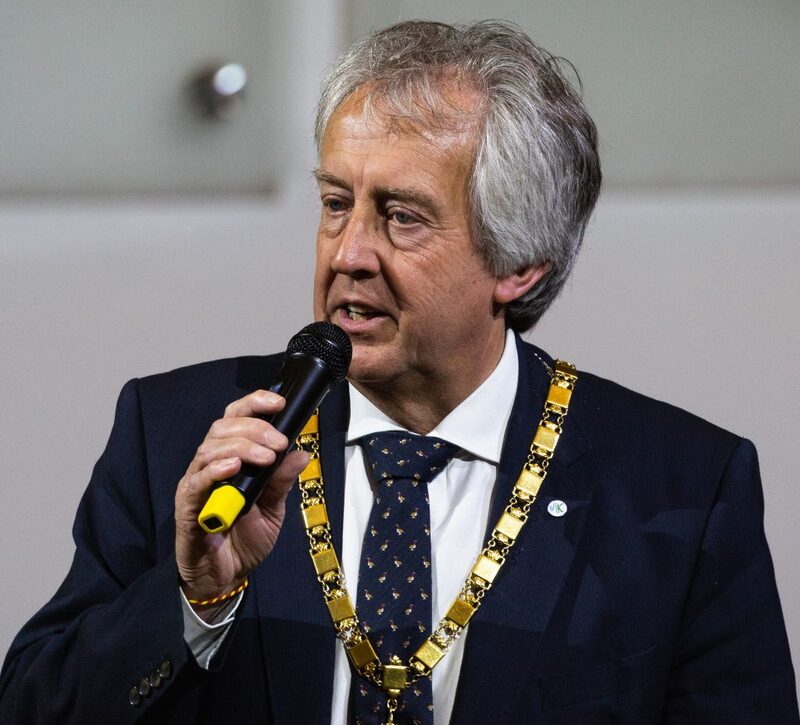 The Assembly were shown a video of the MK Council Leader’s apology for absence and accountability for actions he has taken over the past year – click here to see the video. 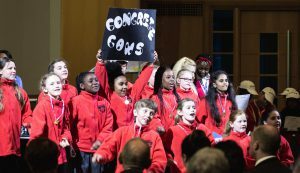 Having earlier performed a mime of ‘building bridges, not walls’ to John Lennon’s ‘Imagine’ song by the Youth Choir of Church of Christ the Cornerstone, the pupils of Summerfield Primary School performed ‘We Built This City’ (pictured above) to great applause. “I just wish we’d all got up and danced to that one!” said Carmel Schmid, a seasoned Citizens:mk campaigner, after the event. from Arriva Buses, to run a hate crime awareness raising poster campaign on MK buses. from Pam Weston of Summerfield School, to run a schools poster competition to raise awareness of hate crime. from Liz Gifford of MK Council, to host a peer support meeting for victims of hate crimes in MK. from Supt Vince Grey of Thames Valley Police, to plan a restorative justice event. 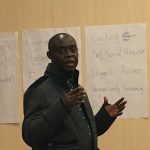 Tyrone Blackford-Swaries (pictured above), recently appointed Director of MK Mental Health Services, heard testimonies and agreed to work with the Citizens:mk Mental Health campaign team, meeting quarterly, to help achieve its goals. Leaders from the three largest political parties in MK Council – Labour, Conservative and LibDem, also pledged support for Citizens:mk’s campaigns 2017-18 and signed the Fight Against Hate charter. In an evaluation session immediately after the event, this year’s Assembly scored 7 out of 10. 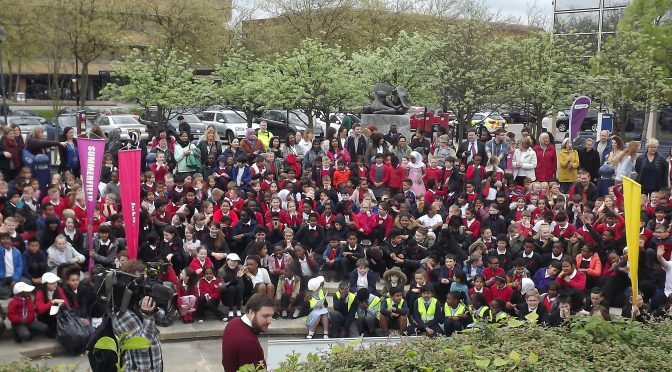 On Friday 21st April, 400 pupils from five MK schools walked from their schools to the city centre to ask the Leader of the Council for 50 Redways improvements in MK’s 50th birthday year. This was the first major action of the Redways Relaunch campaign, which was filmed and broadcast on BBC TV Look East. 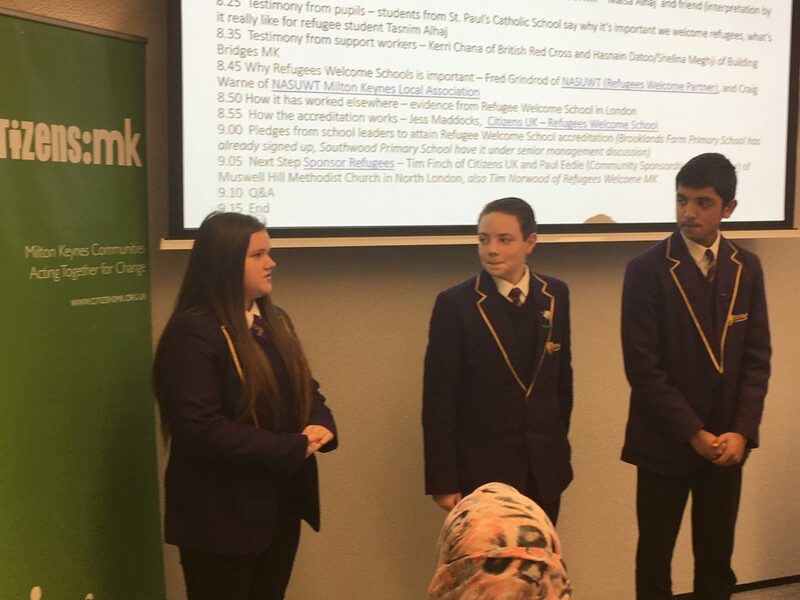 Two pupil leaders, from MK Academy and St. Paul’s Catholic School (pictured below left), knocked for Cllr Pete Marland at Civic Offices and asked him to accompany them across the road to City Square, outside Marks & Spencers, where all the other students and pupils were gathered. 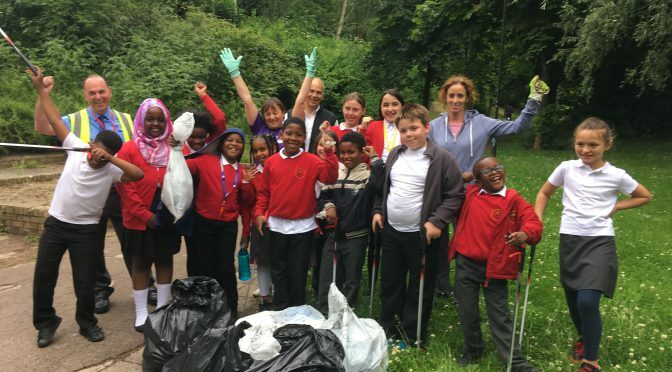 Employees from local businesses including Dentons, Santander and Shoosmiths, joined the action and pledged to help support the schools on Redway litter patrols later this term. A survey of 2,300 pupils in six schools showed that 80% of pupils use the Redways but only 40% think they are safe (survey results). A pupil from Southwood Primary School said: “The more people use the redways, the less scary it is”. 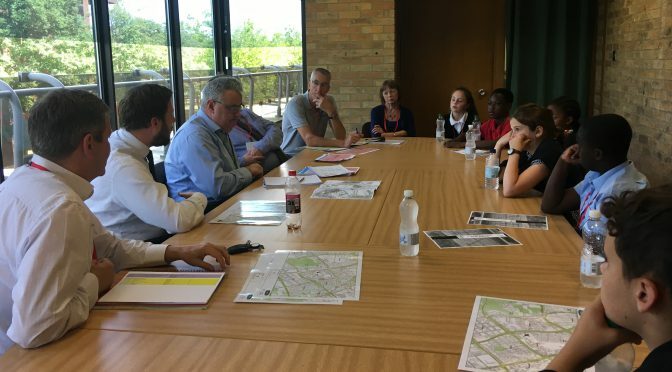 Cllr Marland pledged to support the pupils’ goal of 50 realistic Redway improvements and organise for his senior officers to meet with the pupils so that plans would be agreed before the end of MK’s 50th birthday year. For this he was thanked with a garland decorated with pupil comments on the Redways. 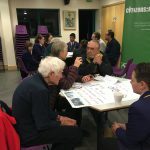 The five schools who took part in the action were members of Citizens:mk, an alliance of 23 community groups including churches and Muslim associations as well as schools, who had taken part in a joint training session back in September and resolved then to launch a Redways campaign. 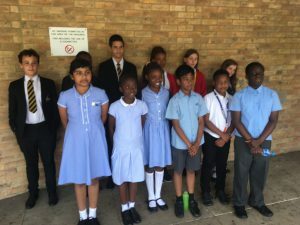 The schools (and number of pupils they brought to this action) were: Jubilee Wood Primary (22), MK Academy (13), St. Monica’s Catholic Primary (8), St. Paul’s (7) and Summerfield (360). 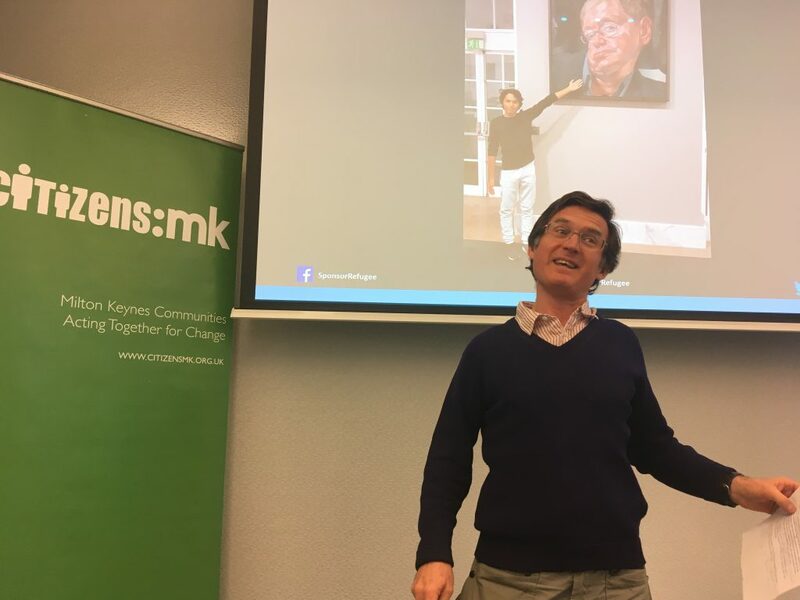 “We value active citizenship and training young leaders from schools is an important part of what Citizens:mk does,” said Lucian Hudson, Chair of Citizens:mk and Director of Communications at The Open University.